Glacial plucking in a descending and diverging cold-based ice stream. Illustrative Feature 07 is shown above. 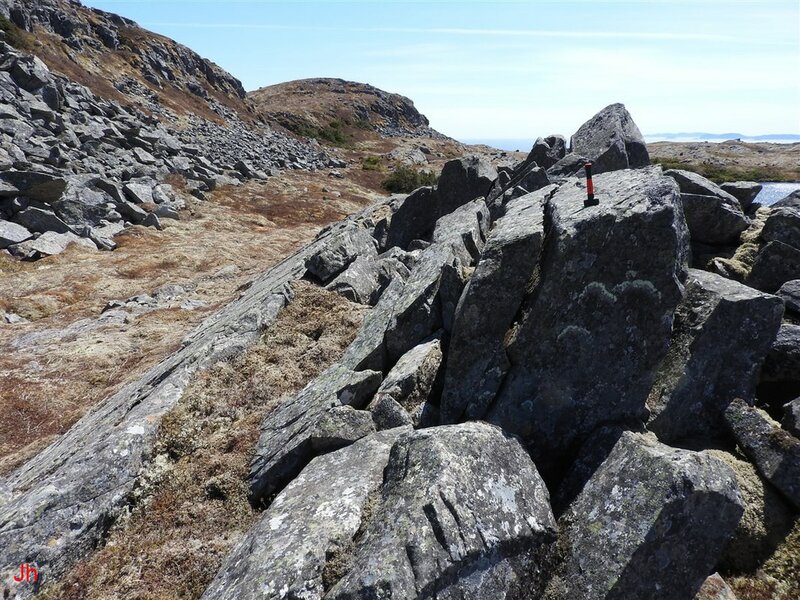 This small bedrock ridge, 43 m long, 5 m high and lying 2.8 km from the coast on the Isthmus of Avalon, has undergone two sequential stages of glacial erosion. The feature was first carved and smoothed by basal slip glacial erosion during the main phase of the Wisconsin glaciation. Then, during the Younger Dryas cold period, the feature was eroded by plucking by a cold-based ice stream descending and diverging directly over the ridge. The circumstances of formation of the ice-disrupted ridge, IF-07, provide an opportunity to look closely at glacial plucking and the processes that lead to bedrock shift in a glacially plucked environment. In the context of the following discussion, the term "plucking" will be used in its most general sense to mean any disruption of bedrock at the lee side of a hill or ridge by glacial ice flow or pressure, acting directly or indirectly. 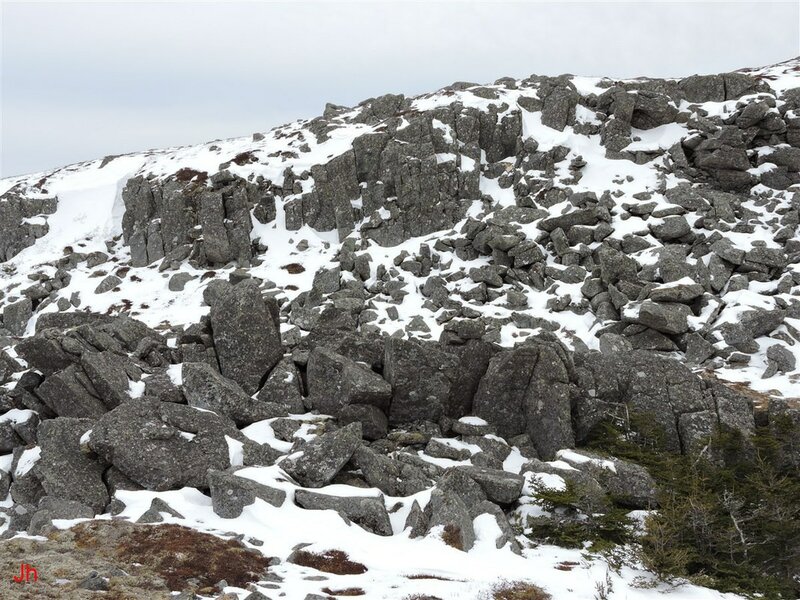 The purpose for examining the glacially plucked ridge, IF-07, is to investigate a model for cold-based glacial plucking whereby glacial ice, in effect, passes through intact bedrock under conditions where pressure-melting does not occur. 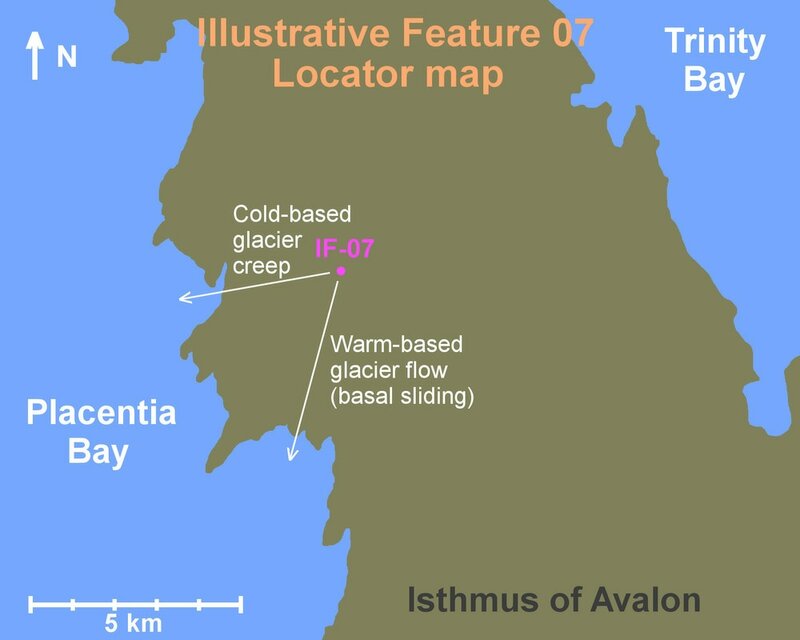 The above map shows the location of the ice-disrupted ridge, IF-07, relative to the nearby shoreline of the Isthmus of Avalon. Two directions of ice flow are indicated, an earlier direction (southerly) and a later direction (westerly). The southerly-directed line of flow follows the axes of folding in the local bedrock. Ridges and valleys in the area are generally aligned in this direction. This aligned topography would tend to channel ice flow southward to the ocean via basal-sliding mode during the rapidly warming late stages of the Wisconsin, but prior to the Younger Dryas. With the assumption that warm-based glaciation on the Isthmus transitioned to cold-based glaciation during the Younger Dryas, south-directed basal sliding could have given way to west-directed creep, as illustrated on the map above. Evidence for such a transition is provided by patterns of streamlining, then plucking, on IF-07 and on nearby hills and ridges. The above photo shows a view of ridges and valleys just southeast of IF-07. The photo was taken with the camera pointing in a southeasterly direction and south is on the right. The topography is indicative of ice moving in a southerly direction. The above picture shows a southerly-directed basal-slip ice path running alongside the east slope of the small ridge, IF-07. The smoothed lower front face of ridge, IF-07, is seen on the right, while the heavily plucked west face of a large ridge lying east of IF-07 appears on the left. The first (left) picture above shows the view directed north toward the minor ridge, IF-07, which appears (small and hard to recognize) above the center of the photo, just below a small lake. The second (right) photo shows a southerly-directed view looking toward the ocean. IF-07 is seen just above the small lake. The two photos illustrate the probable south-directed path of warm-based glacial ice moving parallel to the major ridge that lies immediately east of IF-07. This major ridge is tectonically aligned, as is IF-07. The ice-disrupted bedrock ridge, IF-07, is shown colored dark brown on the above map. IF-07 lies at the center of a small valley between a major ridge to the east and a low hill to the west. IF-07 occupies a saddle point in the local topography, with elevation rising east and west of the feature and elevation declining north and south of the feature. Like IF-07, the major ridge to the east of IF-07 appears to have been shaped and smoothed by southerly-directed basal-slip glacial erosion before being severely fragmented (plucked) by westward-moving glacial ice just prior to deglaciation. A fissure in the bedrock at the south end of IF-07 is indicated by a short magenta-colored line on the above map. This fissure, the "south fissure", will be discussed in detail later in this section. The elevation relative to present-day sea level of a path crossing IF-07 is shown above. The illustrated profile is orthogonal to a line directed 15 degrees east of geographic north (approximate axis of local folding) and the path direction is indicated beneath the arrows shown on the chart. 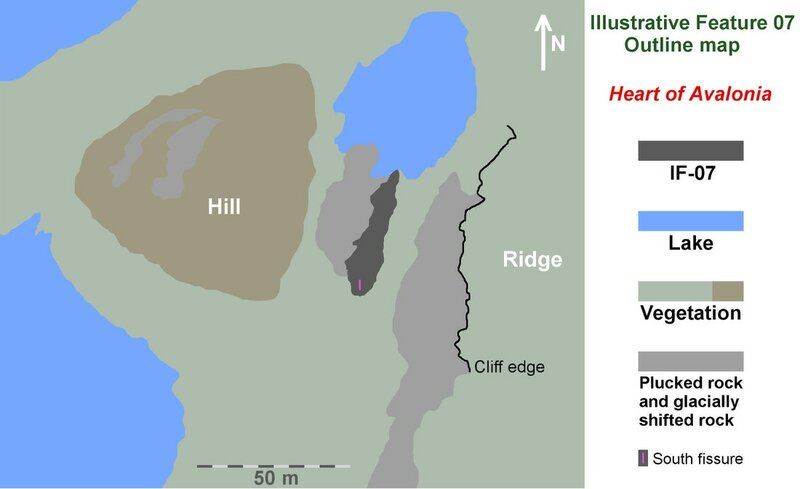 Observations of plucking and rock displacement suggest that glacial ice moved down the west slope of the east ridge, across the center of IF-07 while also diverging northward and southward, and down the west slope of the hill west of IF-07. 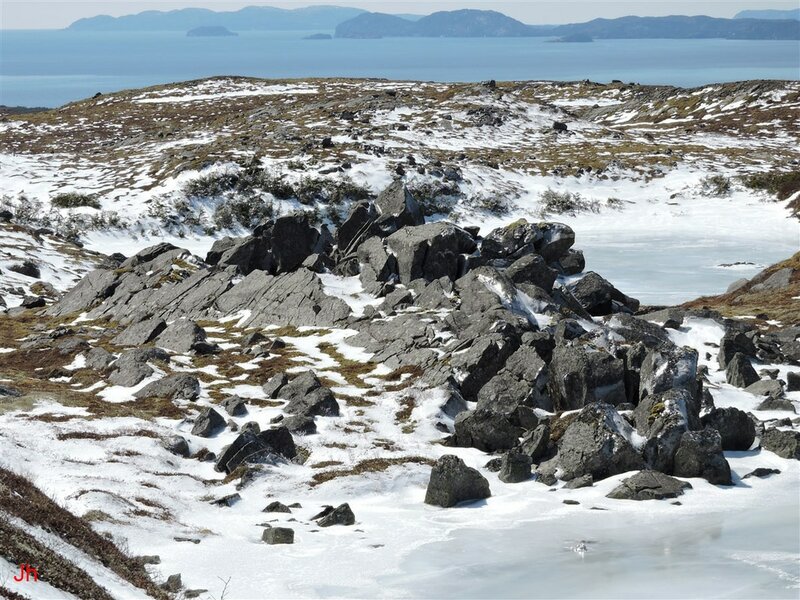 However, the limited total displacements of ice-disrupted rock fragments suggest that the westerly trending ice flow was a creep-only flow involving cumulative near-ground ice movement on the scale of tens of centimeters. 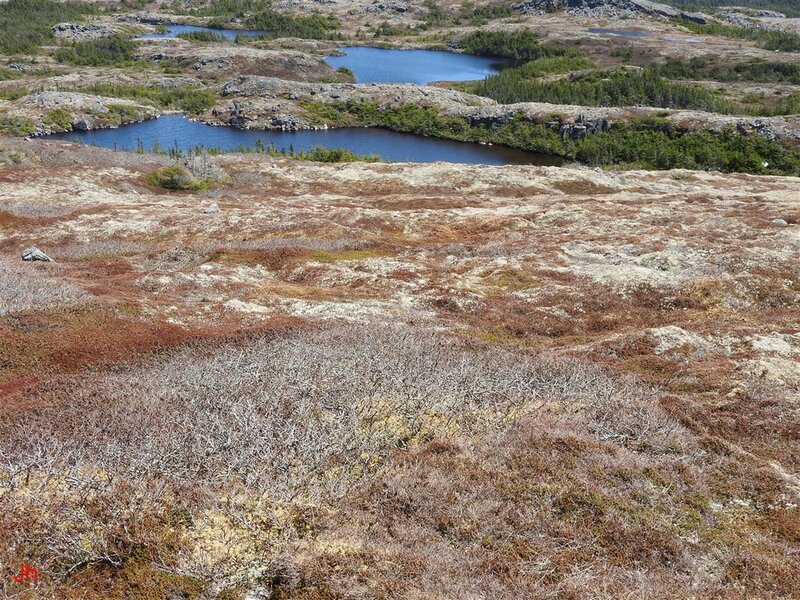 The above photo shows a view down from the top of the ridge immediately east of IF-07. 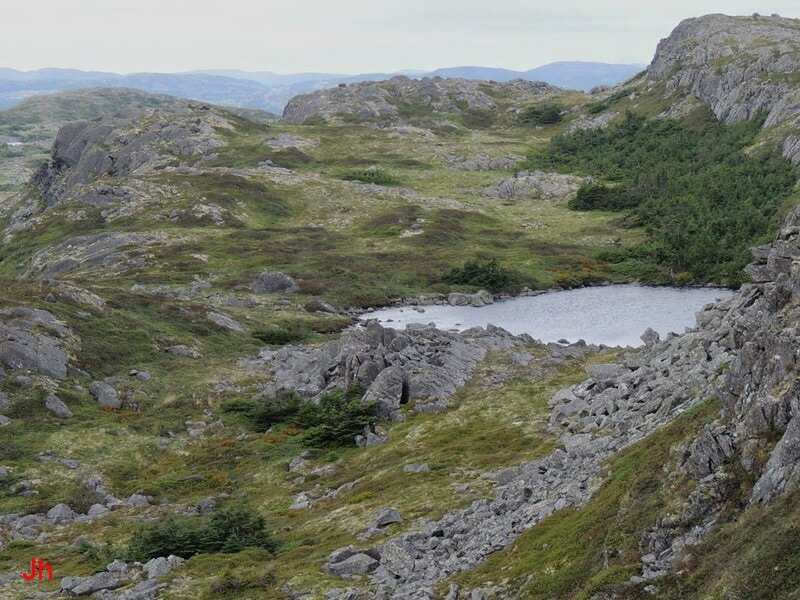 The view looks directly east and shows the eastern slope of the ridge in the foreground, extending down to a lake approximately 40 meters (measured vertically) below. The topography illustrated in the above photo was presumably carved out by thick southerly-moving warm-based glacial ice prior to the onset of the Younger Dryas cold period. The west-directed view appearing above shows the east side of the ridge lying east of IF-07. The feature, IF-07, would appear at the center of the photo if the prominent obstructing ridge were not present. 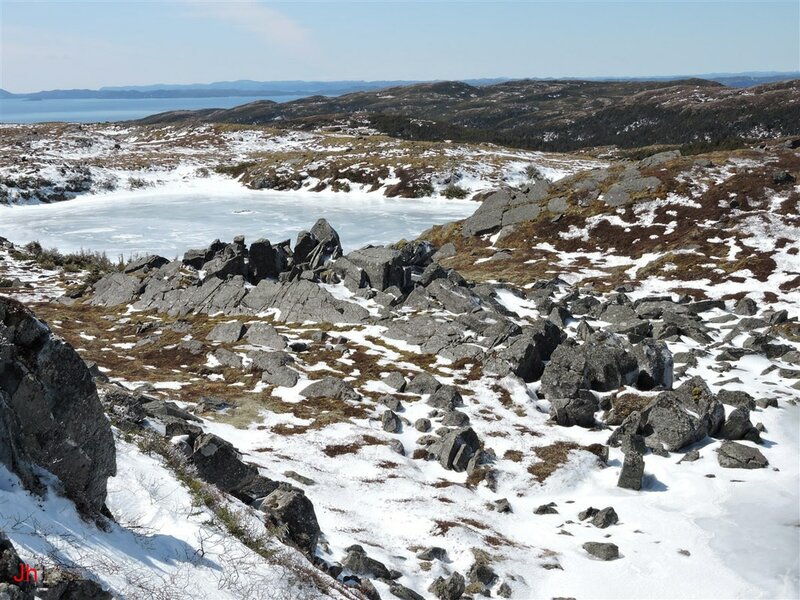 The C-shaped ice disrupted bedrock feature, IF-07, is seen in the foreground of the above photo, taken looking west from the top of the major ridge immediately to the east of IF-07. The feature of interest, IF-07, extends almost entirely across the front of the field of view, terminating on the north (right) end in the water of a small lake. The rear delineation of the feature is plainly visible against vegetation (left of center in the photo), but is harder to discern (right of center) because of an area of glacially transported boulders lying behind the ridge and forming an indistinct low-contrast border with the broken rocks at the back of IF-07. The overall shape of the ridge, IF-07, is roughly symmetric left-to-right as viewed from the angle of this photo. 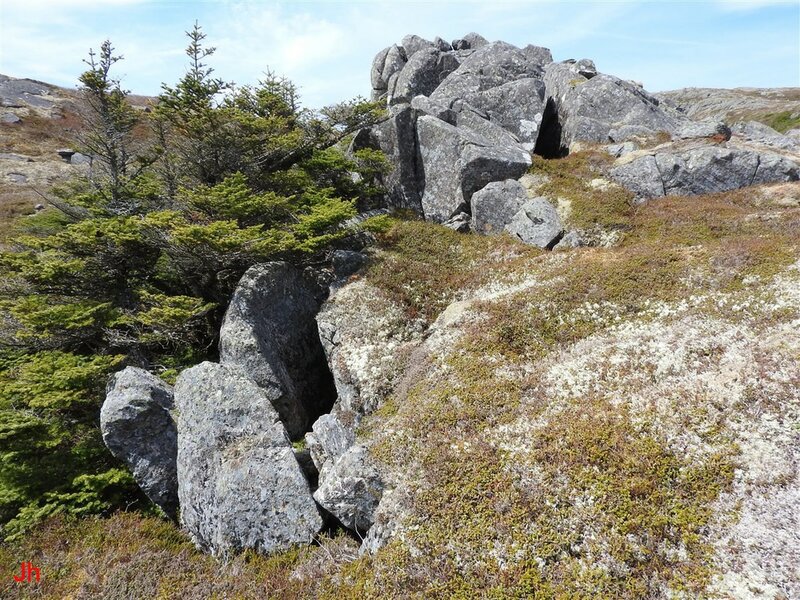 The relatively smoothed sloping rock at the front of IF-07 is unshifted bedrock, and the rock cropping out through the vegetation seen in the photo just below IF-07 is also mainly unshifted bedrock. 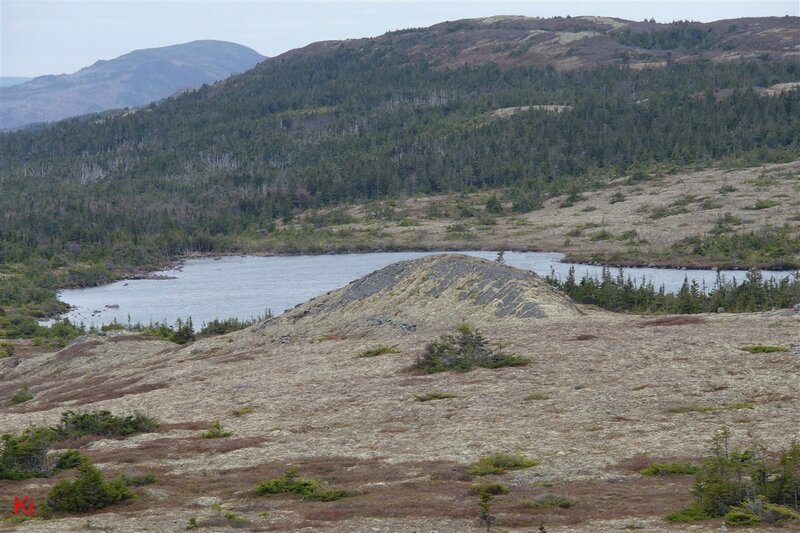 The small field of glacially transported boulders seen behind the ridge and to the right does not appear to be directly associated with the ridge, IF-07. 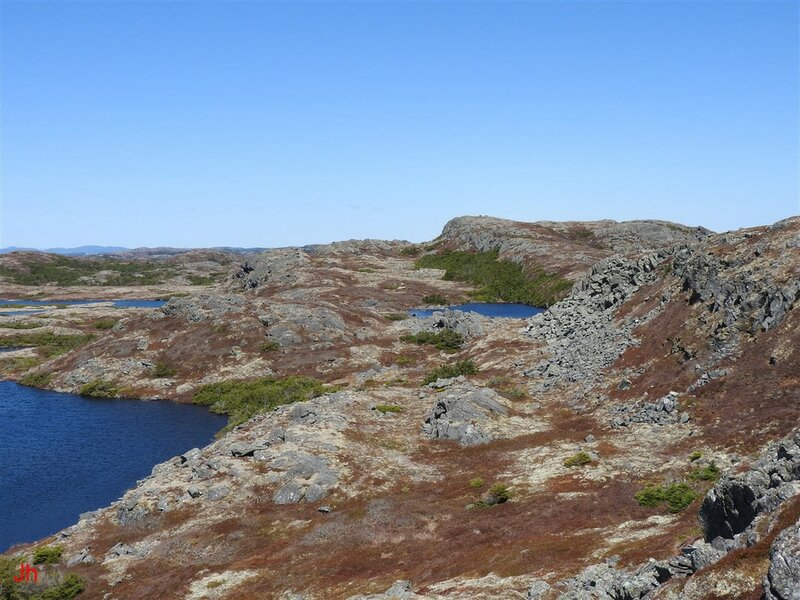 First (left) a small ridge similar to IF-07, but at another location on the Isthmus of Avalon where secondary disruption of the glacially smoothed landform did not occur. 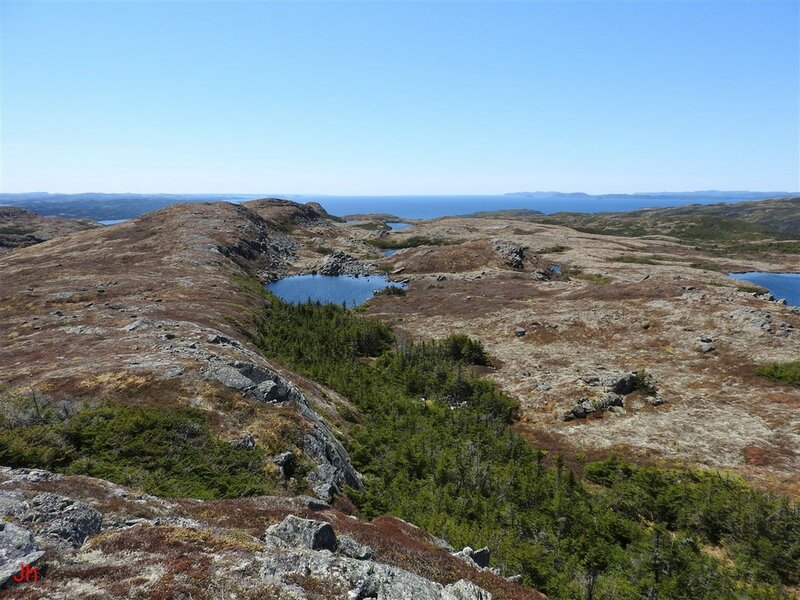 Second (right) the ridge, IF-07, viewed from a comparable angle. In the second (right) photo above, the heavily ice-disrupted north end of the ridge, IF-07, extends all the way into the water. A closeup of the comparative ice-carved C-shaped small ridge is shown above. 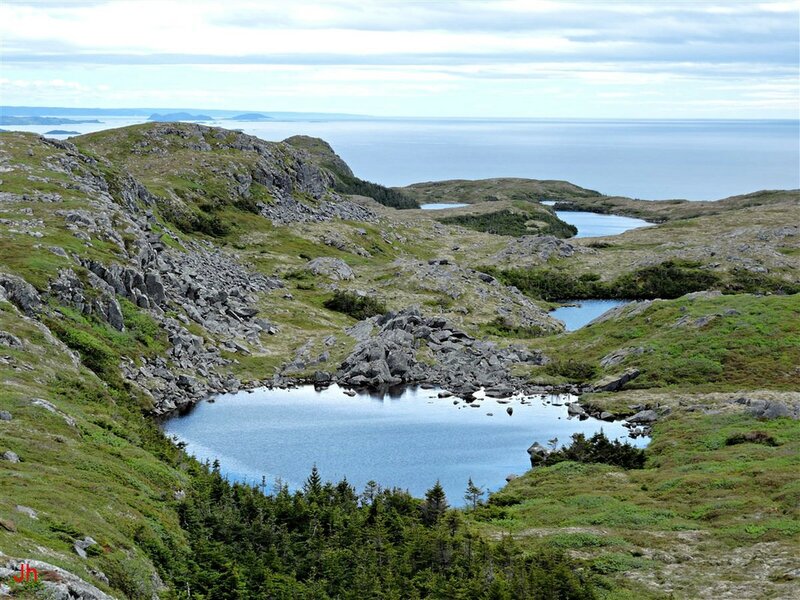 This ridge, possessing a shape frequently seen on the Avalon Peninsula, provides a prototype for IF-07. The ridge is tectonically aligned and has been smoothed by glacial erosion on all sides with little evidence of plucking. Ridges like this appear to have formed where longitudinal tectonic cleavage dips at an intermediate angle (limb of a fold) and a sloping plane of bedrock becomes subdivided into stand-alone ridges by basal-slip glacial erosion. The rounded C-shaped form represents the final stage of erosion of what was originally a homocline and subsequently a cuesta. The ridge shown above has experienced basal-slip erosion similar to that which initially shaped the ridge, IF-07. However, unlike IF-07, the above-pictured ridge did not experience a second stage of aggressive erosion caused by plucking by a cold-based glacier. 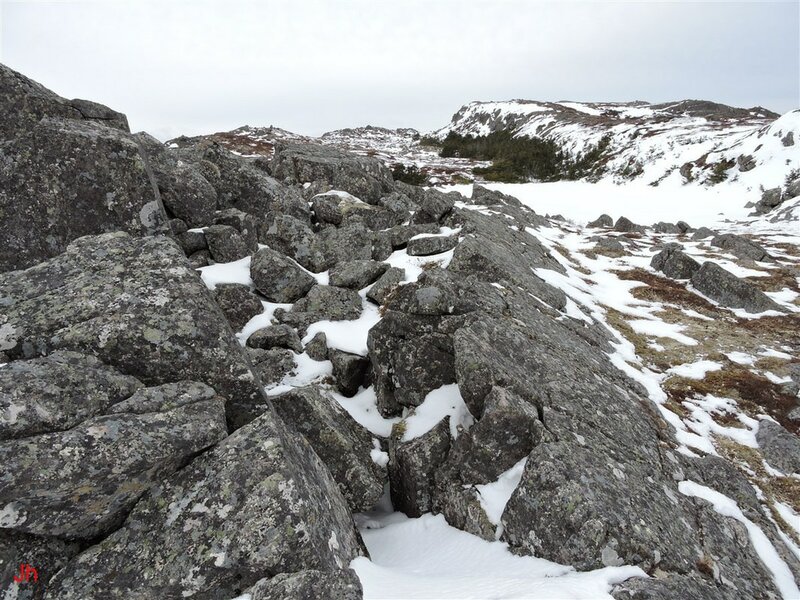 The picture above, looking east, shows the west side of the ridge, IF-07, set off visually from the background rocks by snow and a light mist. The severity of ice disruption affecting the ridge, IF-07, is plainly apparent in this photo. 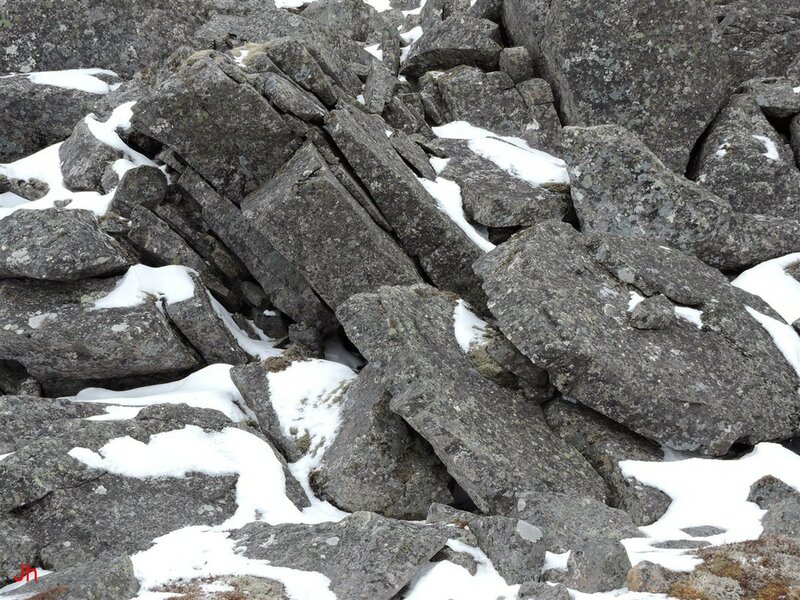 In spite of the chaotic outward appearance of the ice-shifted rock fragments, close inspection reveals that most of the rock originally present in the glacially-smoothed precursor ridge has not moved very far. The above photo shows the west side of the hill lying west of IF-07. 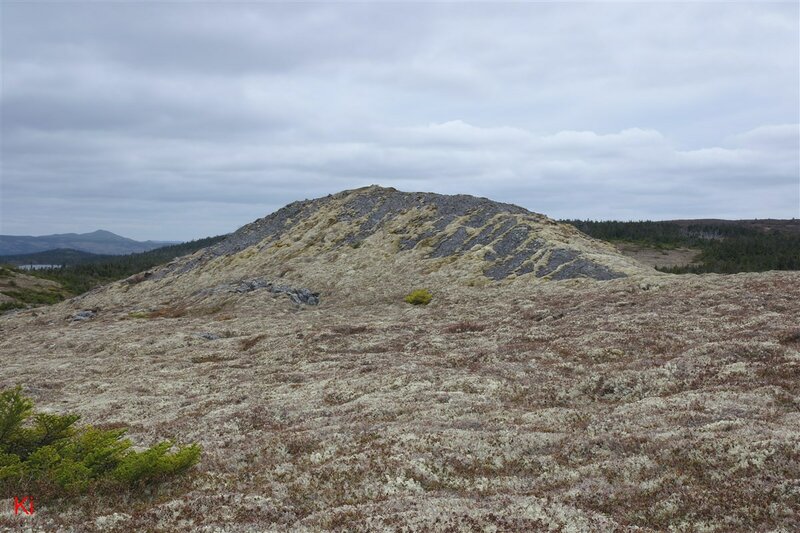 This hillside, like IF-07 and the ridge east of IF-07, has been eroded by glacial plucking. Although a considerable amount of fragmented rock is visible at the base of the hill, the average size of the fragments and the total volume of shifted rock seems significantly smaller than the respective fragment sizes and shifted rock volumes observed at IF-07 and the ridge immediately east of IF-07. The relatively minor extent of the plucking on the above-pictured hill is better illustrated in the following photo which shows the west side of the hill viewed from further back. The shape of the hill is somewhat hard to discern because of the lack of contrast between the hill and the background rocks. The diagram above (left) shows a subglacial west-directed view of IF-07, drawn in rough correspondence with the above photo (right). As discussed previously, it is assumed that IF-07 was first shaped in a primary event where basal slip erosion by thick southward-moving glacial ice wore down, smoothed and streamlined the feature. The jagged, plucked appearance of the west side of IF-07 is not compatible with basal slip erosion by a southward moving glacier. The possibility then arises that IF-07 is a roche moutonnee, eroded and plucked by westward moving warm-based glacial ice. This possibility is not compatible with observations at the north and south ends of IF-07. The bedrock fragments at the south end of IF-07 have been shifted southward, while the fragments at the north end of the feature have been shifted northward. These rock shifts will be discussed in detail later in this section. Observations imply that IF-07 underwent plucking by a diverging ice stream, the ice moving westward and downward from the crest of the ridge lying east of IF-07 and then diverting around both ends of IF-07 and around the following hill. This assumption of a diverging ice flow pattern is reasonable, given the saddle-shaped topography at the IF-07 site. A key question arises as to whether the diverging ice stream was warm-based or cold-based. 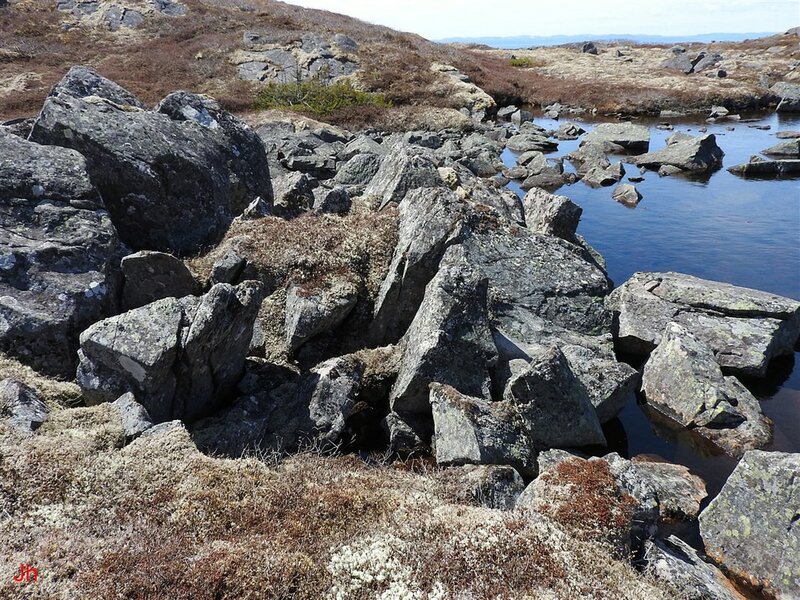 The extensive plucking observed, with rock shifts occurring in three directions (south, west and north) on a small bedrock feature suggests cold-based glacial action. In the conventional view of plucking by a warm-based glacier, a pressure difference (high pressure ahead of obstruction, low pressure behind obstruction) is needed for glacial ice to melt, propagate through rock as water and then refreeze. With an ice stream descending and diverging over a small elongated obstruction, ice pressure at the central region would not be expected to differ greatly from that at the ends. Plucking at the north and south ends of IF-07 would therefore not be driven by a regelation process associated with a significant change in ice pressure. It must therefore be assumed that plucking observed at the north and south ends of IF-07 was unlikely to have been caused by a regelation process. If plucking is not caused by refreeze of pressure-melt water, then either ice segregation pressure or direct mechanical action of overlying glacial ice must be responsible for observed rock shifts. 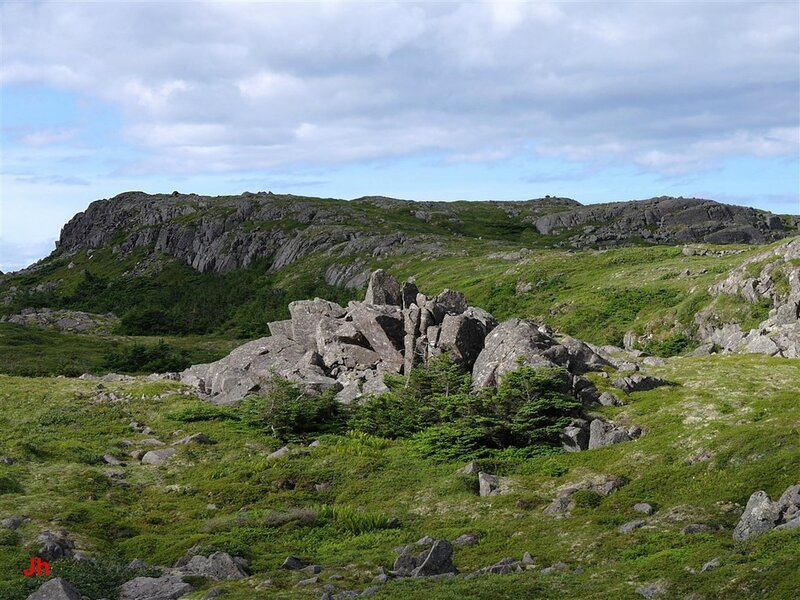 The possibility of direct mechanical action by overlying glacial ice can be eliminated in many instances at IF-07 by noting the lack of rotation in several tall blocks of shifted bedrock at the north, central and south regions of the ridge. Tall elongated blocks with an aspect ratio (height>>length or width) would be expected to rotate about a horizontal axis when pushed horizontally (as by glacial ice), with the applied force acting primarily at the top end. Some rotation of blocks is observed at IF-07, but in several notable instances rock shifts occur with little or no rotation. 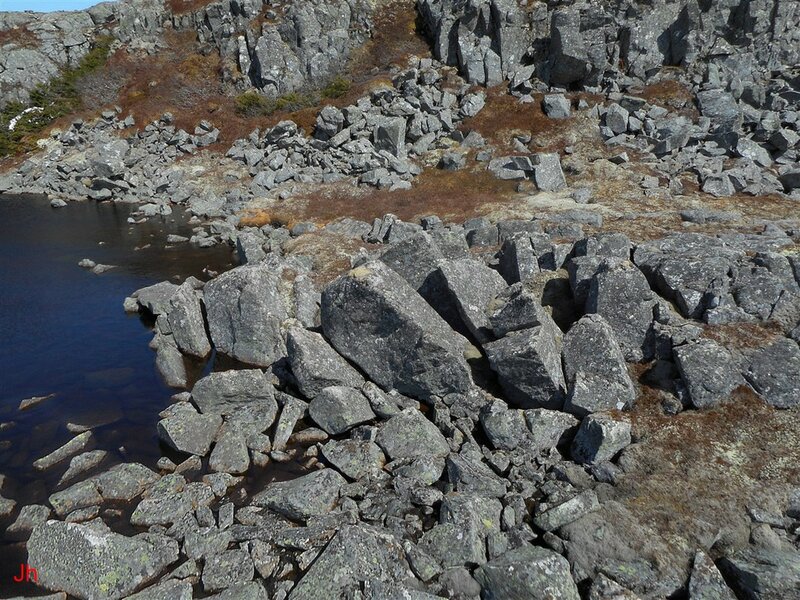 Absence of rotation suggests that force was applied evenly to the top and bottom of vertically elongated bedrock fragments. Subglacial ice segregation, a process requiring a cold glacier-bedrock interface, remains as the only consistent explanation for many of the rock shifts (plucking occurrences) observed at IF-07. Therefore, as indicated at the beginning of the discussion of IF-07, the fragmentation (plucking) of IF-07 is best viewed as a secondary erosion stage, entirely separate from the primary basal-slip erosion of the feature by warm-based glacial action. This secondary erosion stage exemplifies plucking by a cold-based glacier. The above (left) diagram shows lines of creep direction in a descending and diverging cold ice stream overlying IF-07. Within the context of the model illustrated in the diagram, the ridge, IF-07, is assumed to effectively comprise a part of a cold-based glacier and to move in tandem with glacial ice creep and subglacial ice segregation (see bedrock glacier model **this model needs updating (pending) but is still relevant). 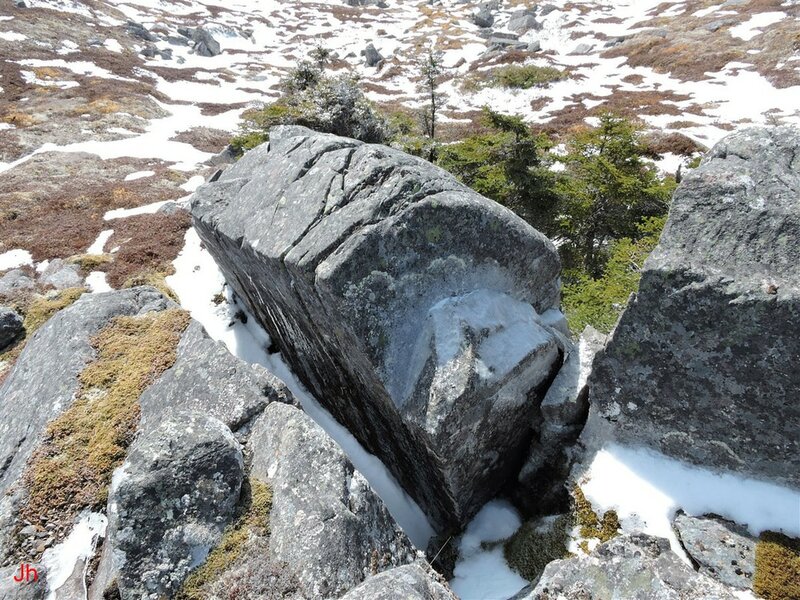 The assumption of cold-based plucking opens questions as to how cold glacial ice infiltrates bedrock, travels within bedrock and emerges from bedrock, imparting mechanical energy to the rock (shifting it) in the process. 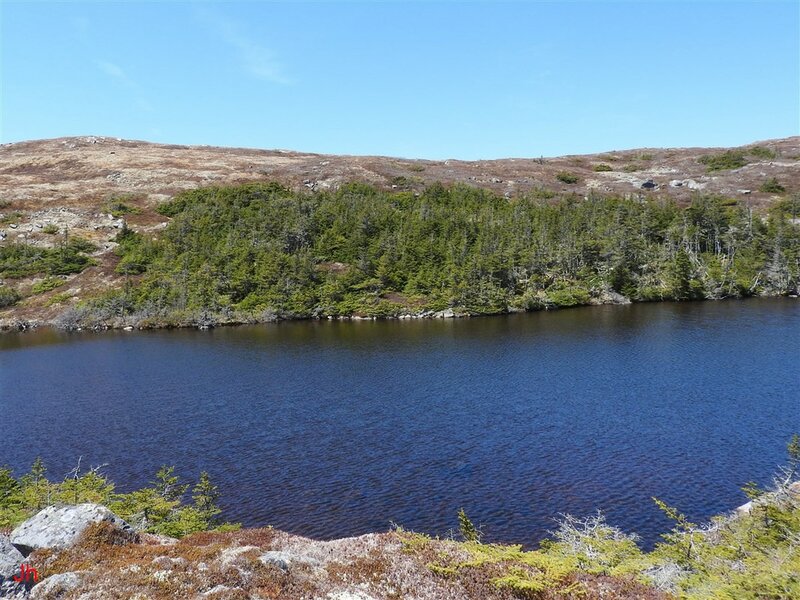 In shedding light on these questions, analysis of IF-07 may help support the previously introduced Subglacial Ice Segregation/Cold Deglaciation model used to explain bedrock frost heave on the Avalon Peninsula. This is a key rationale for examining IF-07. The northern three quarters of the ridge, IF07, are shown in the above west-directed photo. The magenta arrows show directions of rock displacement caused by glacial ice pressure and movement. The left two arrows indicate rock shift directions in the central portion of the feature. These westward or southwestward rock shifts will be discussed in detail under the heading "Observations, central section of IF-07" while the present discussion will focus on northward-directed rock shifts (rightmost arrow). The photo below shows a closer view of the north end of IF-07. The above-pictured northern section of ridge, IF-07, is about 20 m long. 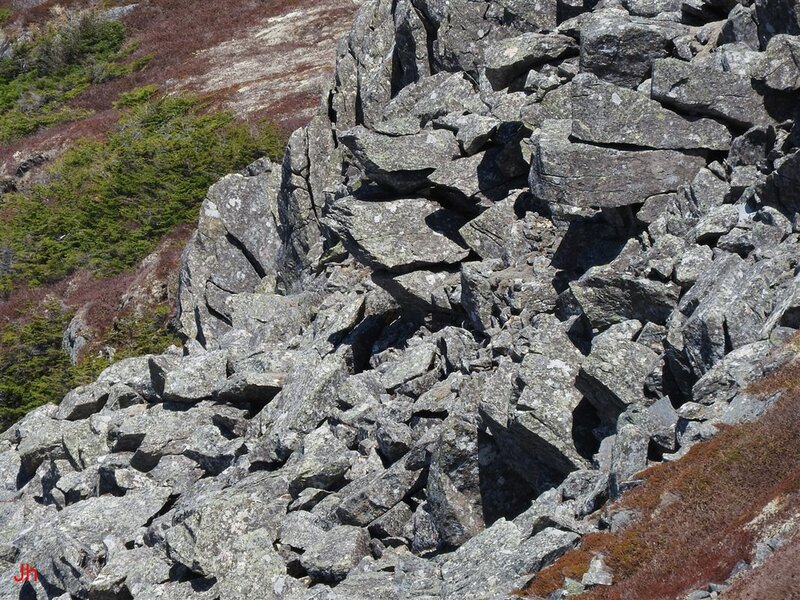 The dark shadows seen on rocks near the center of the frame mark the edge of a significant fissure formed when the rock to the north (lower right on photo) of the fissure shifted northward. The shadowed side of the block at the extreme upper left of the photo does not border an analogous fissure. The section of rock lying north (right) of this upper-left gap is mostly unshifted bedrock. This upper-left gap was formed by westward moving glacial ice that punched through a section of the ridge, displacing rock westward. This will be discussed later under the heading "Observations, central section of IF-07". Two additional recognizable east-west fissures lie north of the central fissure. These are shown in more detail below. Three major east-west running fissures in the north section of IF-07 are visible in the above photograph. The fissure seen above and to the left of center-frame is the same fissure mentioned in the discussion of the immediately preceding photo. This first fissure is about 90 cm wide. The north edge (right on photo) of the first fissure is formed by three large blocks that are separated from each other by north-south running fissures (hard to see from the perspective of the above photo). The north-facing sides of the three blocks form the south edge of a second less distinct fissure. 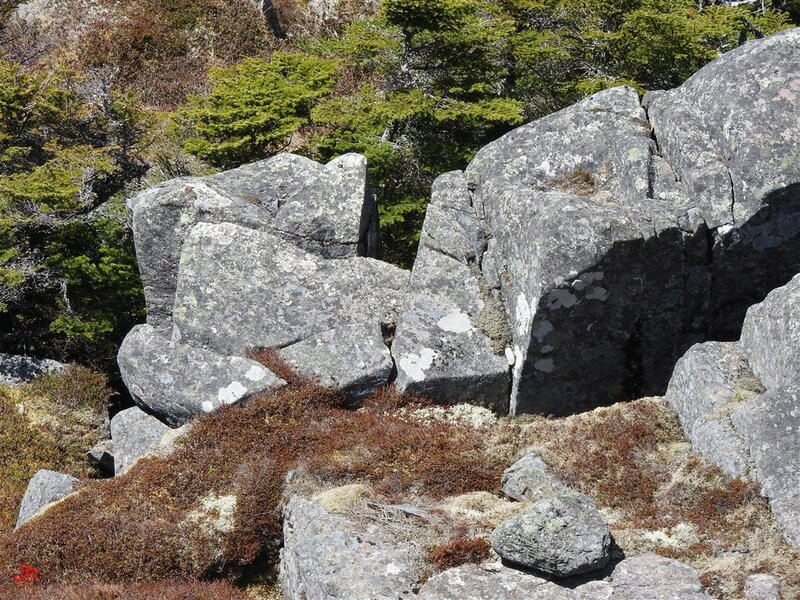 This fissure, about 1.9 m wide contains substantial amounts of broken rock and some of this broken rock is overgrown with moss. Another row of three large blocks (again, hard to delineate from each other in the above photo) forms the north edge of the second major fissure. 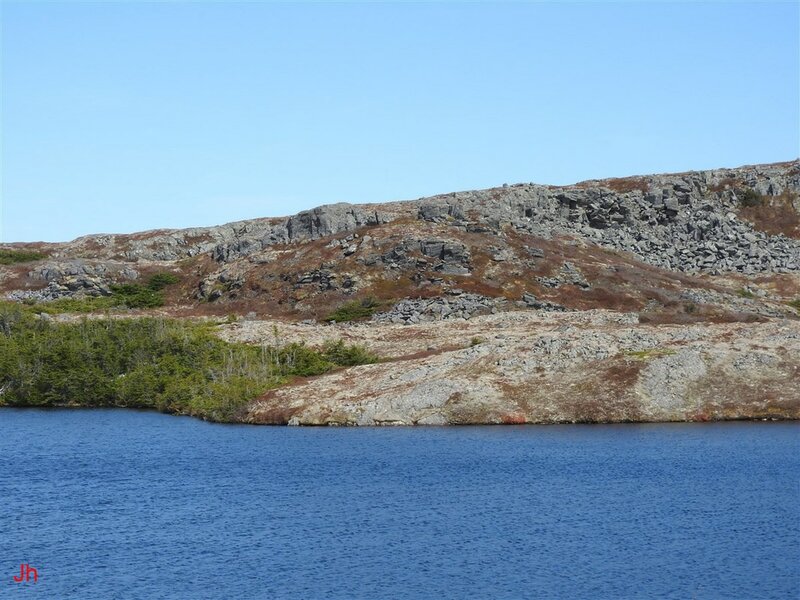 The third fissure begins at the edge of the lake and the displaced blocks forming the north boundary of this fissure lie in the lake. A closeup view of the first-discussed major east-west fissure is shown above. The above photo is roughly centered on the second major east-west fissure. A closeup of the third (northern-most) east-west fissure is shown above. 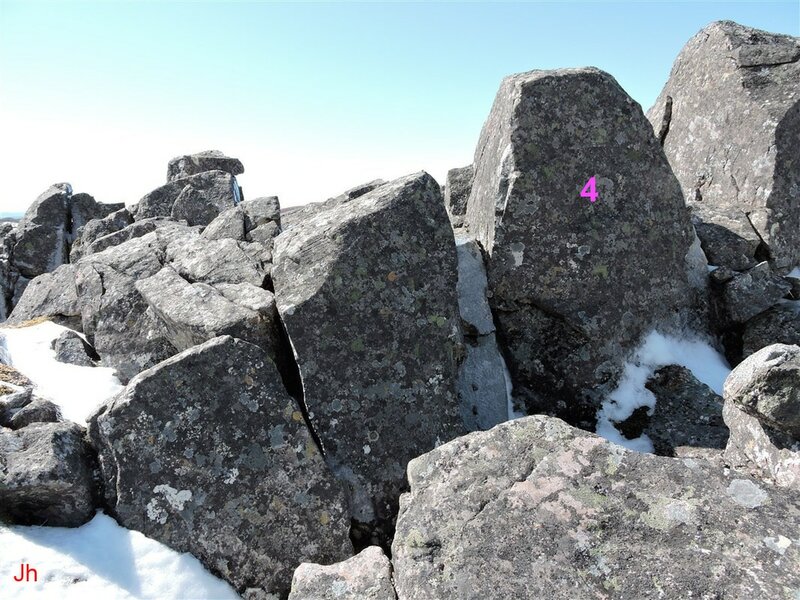 The above annotated photos place letter indicators on eight large ice-displaced blocks to aid in recognizing the layout of the scene at the north end of IF-07. The photos were taken from an elevated platform and the perspective tends to exaggerate the slopes of tipped blocks. Block "A" is about 3.5 m long. 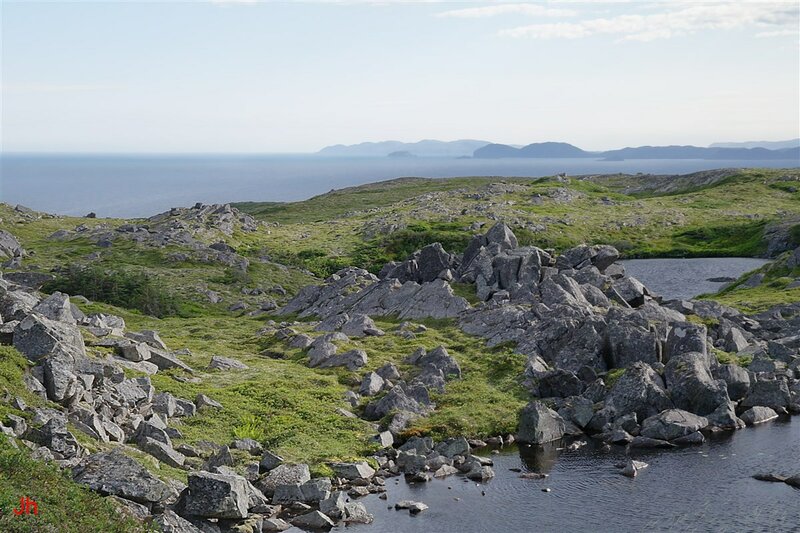 Each of the above three photos is reproduced individually below, along with a fourth annotated photo of the north end of IF-07 viewed from the north. 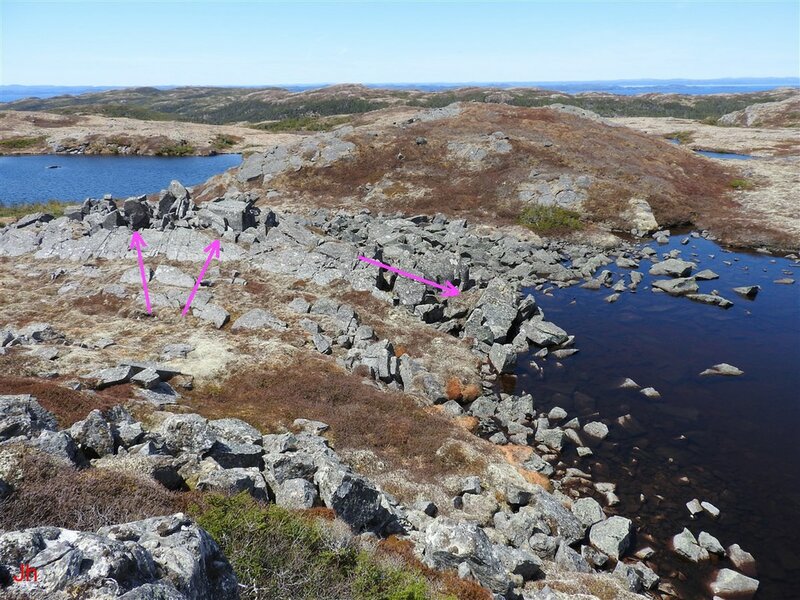 An analysis of the shapes and locations of the major blocks appearing in the above photos suggests that the blocks comprise a once-unified section of bedrock (the north end of the precursor ridge to IF-07) that was divided and shifted (mainly northward) by ice accumulating in fissures between the fragments. Some of the blocks have been significantly rotated about a horizontal axis by an excess of ice movement/accumulation occurring at the tops of the blocks. This rotation represents direct mechanical action by overlying moving glacial ice. 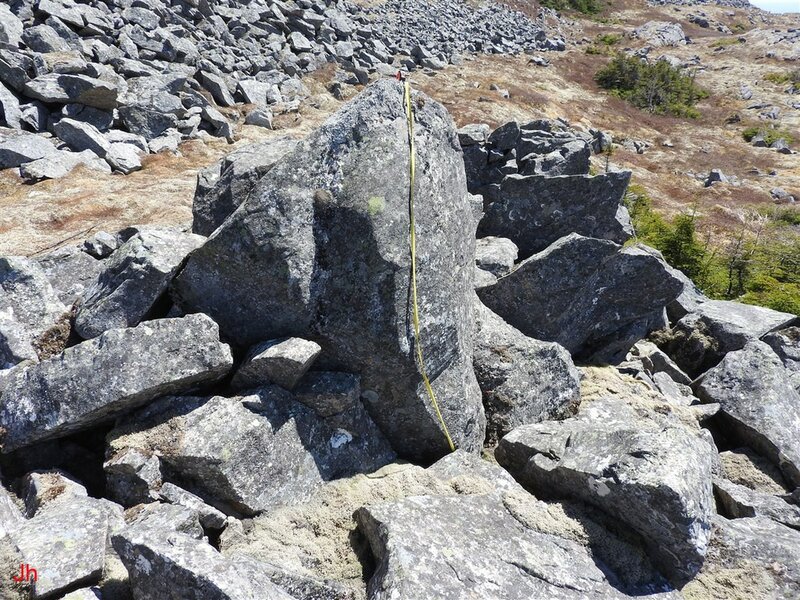 The overall pattern of rock disruption at the north end of IF-07 provides evidence of a subglacial origin for the rock shifts. 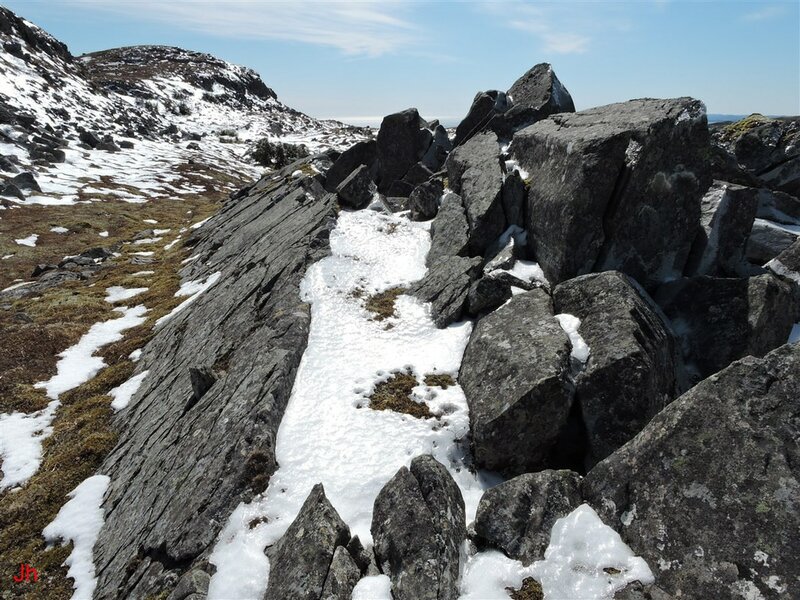 The rock disruption represents a combination of mechanical action by moving glacial ice and glacial plucking via the accumulation of segregated ice in fissures. The large ice-shifted block "C" was pushed north by the opening of the fissure described above and was pushed west by the opening of a linked fissure running northeast-southwest. 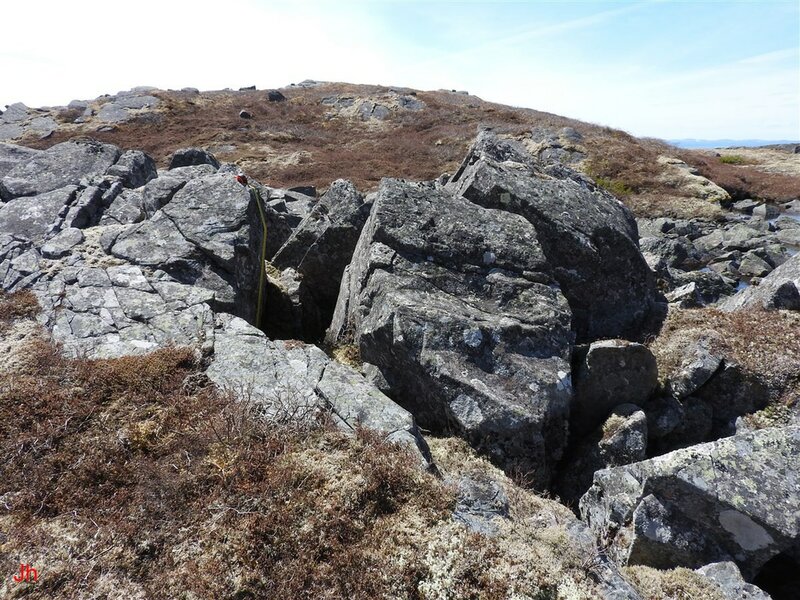 A measurement of the depth of the linked fissure was recorded near the northeast end of the fissure at a point just east of block "C". 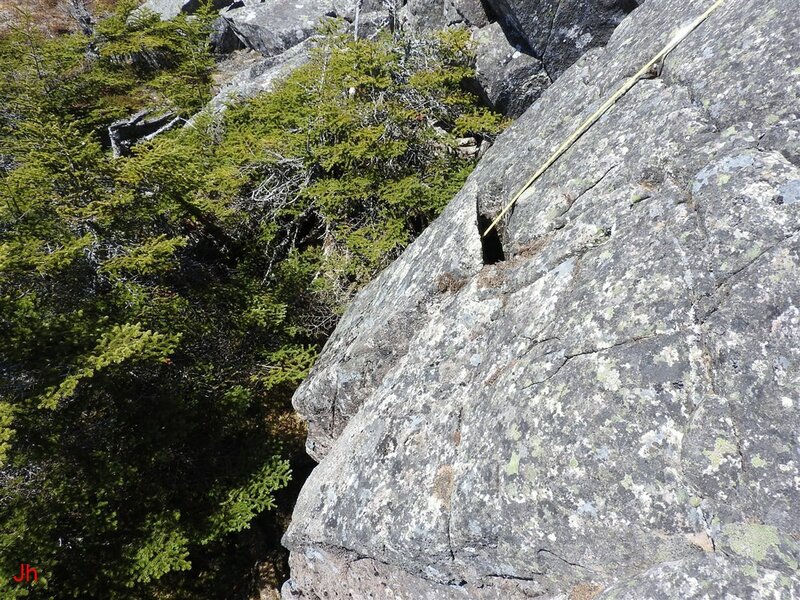 At this location, the drop from the edge of the adjacent unshifted bedrock to the apparent (obstructed by rock debris) bottom of the fissure was measured as illustrated in the above photo. The tape reads 206 cm at the point where it bends. 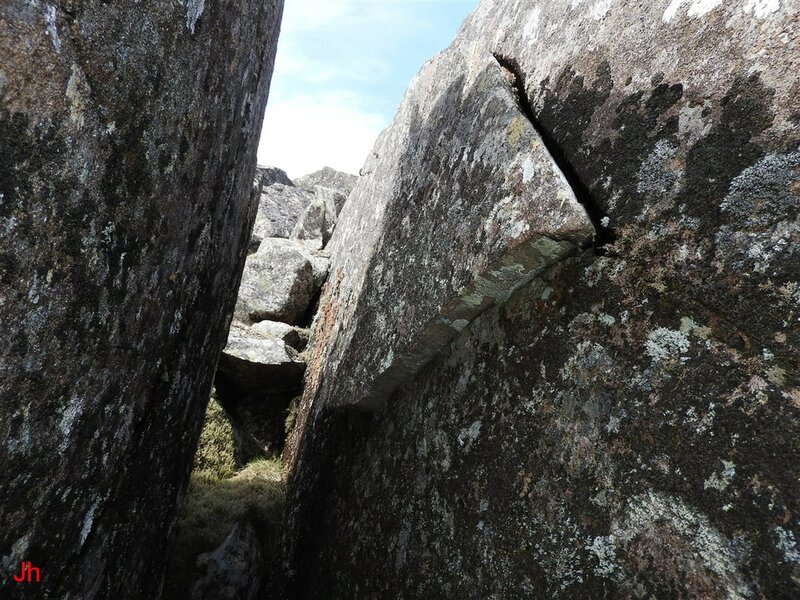 The fissure did not appear to narrow appreciably at depth. 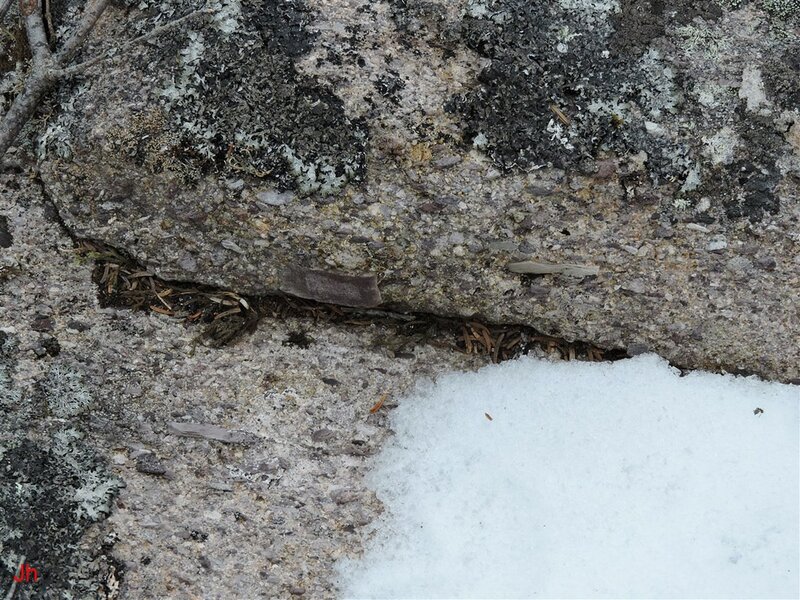 In line with the analysis above, this second measurement further indicates that frost wedging occurring at depth provided the force needed to open the fissure. This frost wedging implies the transfer of glacial pressure via movement of water molecules through the bedrock beneath the floor of the valley adjacent to the ridge, IF-07. The fissure provides an example of glacial plucking by subglacial ice segregation. 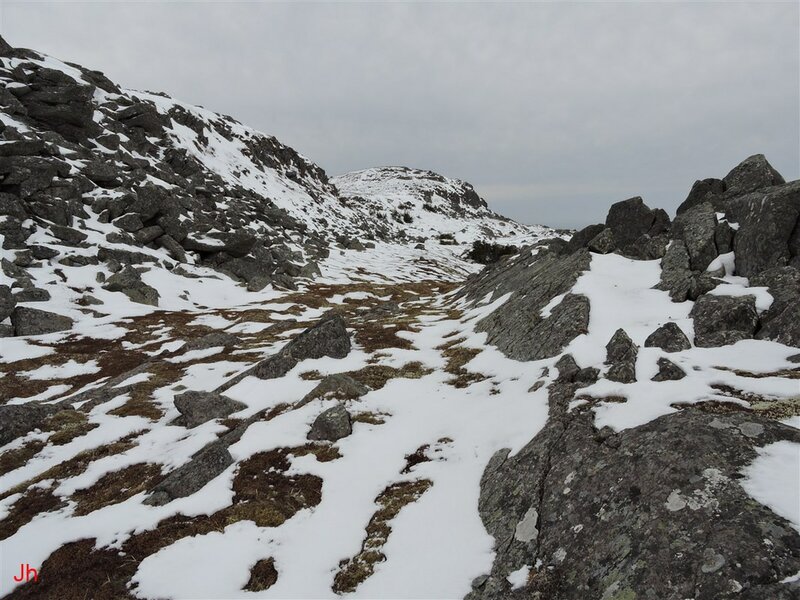 The above photos show an overview of the central portion of the ridge, IF-07. The key features are listed below, with item numbers on the list corresponding to the numbers on the annotated photo. 2) Bedrock floor of the small valley east of IF-07. 3) Large block (3 m width) shifted horizontally westward about 1 m west by ice pressure, but not otherwise tilted, raised or lowered. 4) This block, and the adjacent blocks on each side, form the western edge of a fissure created when the blocks separated from main body of the precursor (intact) bedrock ridge and then shifted in a southwesterly direction. 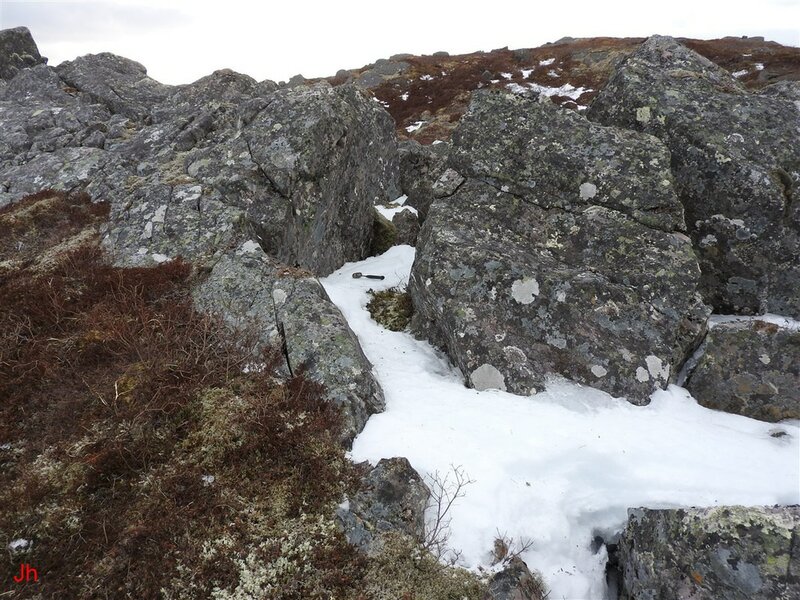 The east edge of the fissure is less distinct owing to the continued wedging and shifting of rock fragments from this edge by ice pressure and advancing glacial ice. 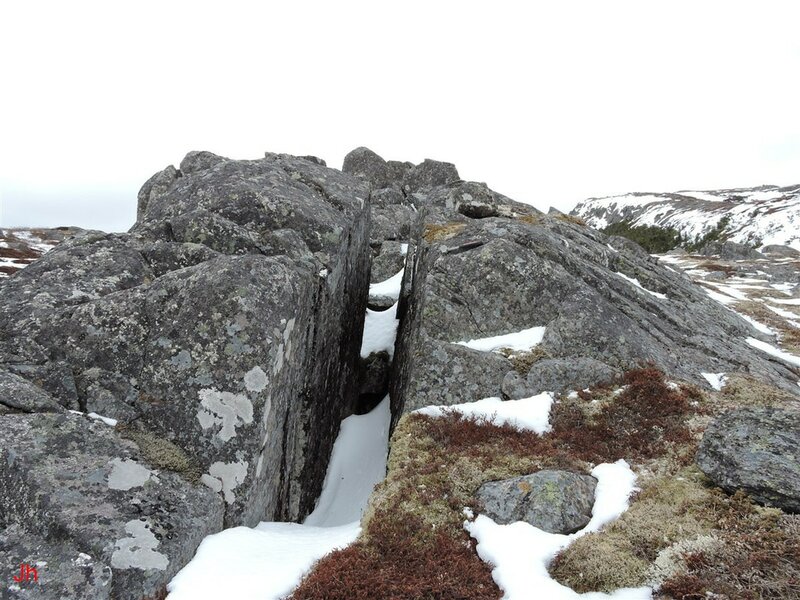 5) Western edge of a fissure running parallel to the fissure described in 4) above. Like the above-described fissure, this fissure appears to have been generated by ice pressure/movement acting in a southwesterly direction. 6) A channel about 2.5 m wide formed by westerly-advancing glacial ice punching completely through the ridge. 7) Blocks rotated top-northward by northward-moving glacial ice. 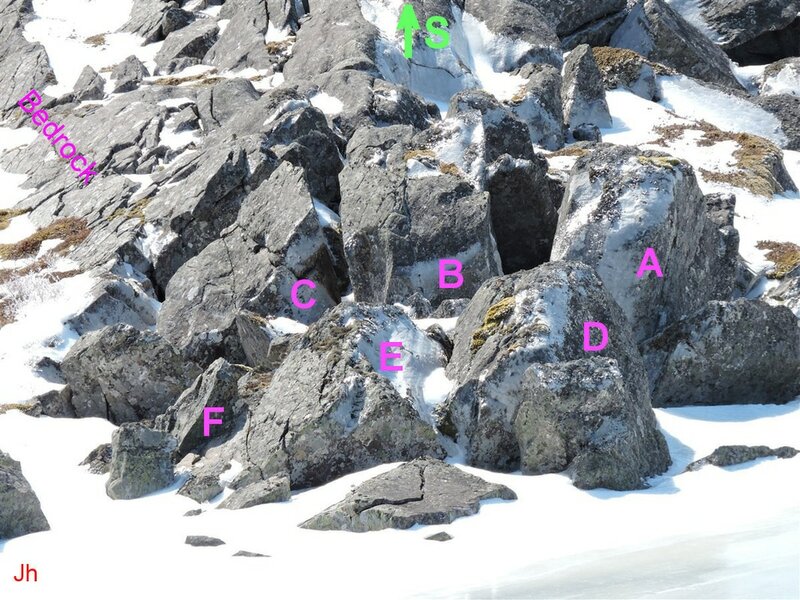 The * symbol shown in the annotated photo indicates the highest point on the ice-disrupted ridge, IF-07, while the # symbol indicates an area where the east side of the fissure mentioned in 4) above is relatively unobstructed by rock debris, making a depth measurement possible. The two photos above show views of the center portion of IF-07 from different angles. 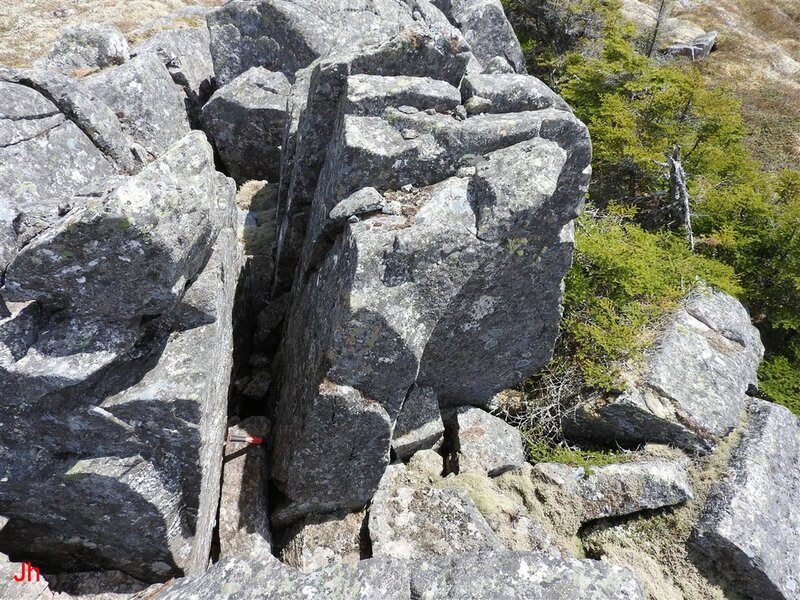 In the top photo, note the accumulation of irregular broken rock lying in the space between the foreground unbroken bedrock and the tall blocks forming the back section of IF-07. 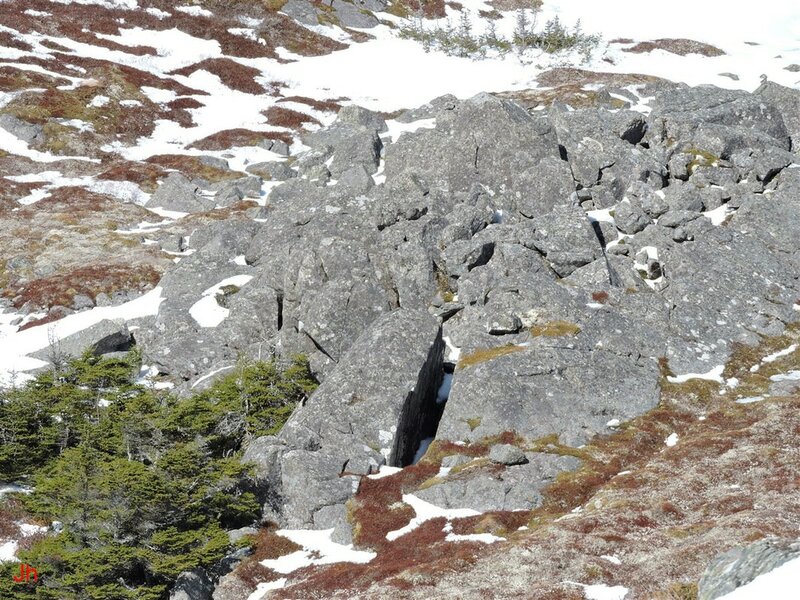 This broken rock likely detached from the east edge of the large central fissure while the fissure was forming and widening. The frost-wedged blocks became entrained in ice and were shifted in an irregular manner, eventually settling into their present chaotic arrangement. In the lower photo, a block (center of photo) that has detached from the front section of bedrock is visible at an unshifted orientation. The second photo shows a wide gap between the block "4" (annotated photo) and the adjacent block on the right (north). This gap is partially the result of block "4" having rotated top-southward. 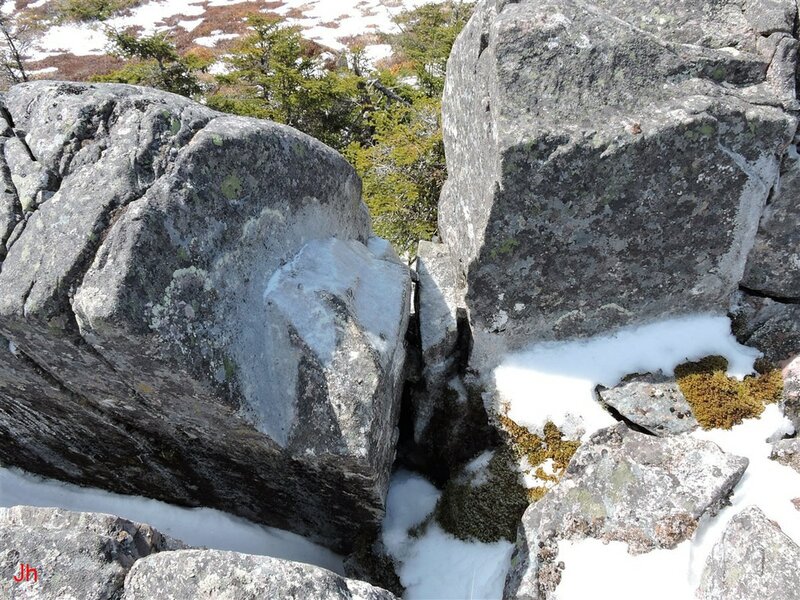 The above north-directed photo shows rock apparently frost-wedged from the front section of bedrock (right on photo, east) by ice pressure/movement directed southwestward as a major fissure opened. In the above view, looking south, the west lip of the unshifted front bedrock is seen, along with some shifted blocks that largely retained their original orientation as they moved westward. The large block "3" (see annotated photo) is visible on the upper right. The top surface of this block is the original top surface of the precursor bedrock ridge. Another view of the ridge, taken from north of center looking south, is shown in the above photo. Note the staged development of fissures leading to cumulative bedrock displacement. 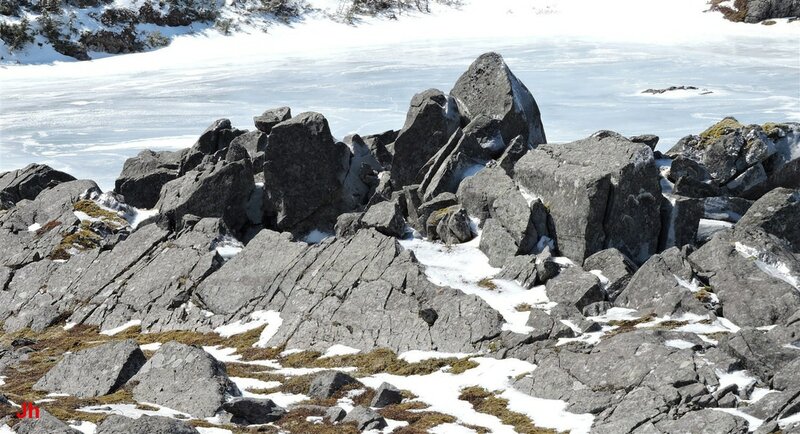 These fissures are suggestive of repeated development of lenses of segregated ice. The fissures are deep, measuring 3 m downward in several cases. The above photo shows a closeup of block "3" (annotated photo). The bands crossing the top front edge of the block are the edges of bedding planes etched out by rain erosion. Much of the rock comprising IF-07 is sedimentary in origin. The ridge encompasses an igneous-sedimentary contact, however, and some of the bedrock in IF-07 is volcanic (tuff or ignimbrite, see "Bedrock composition..." later in this section). 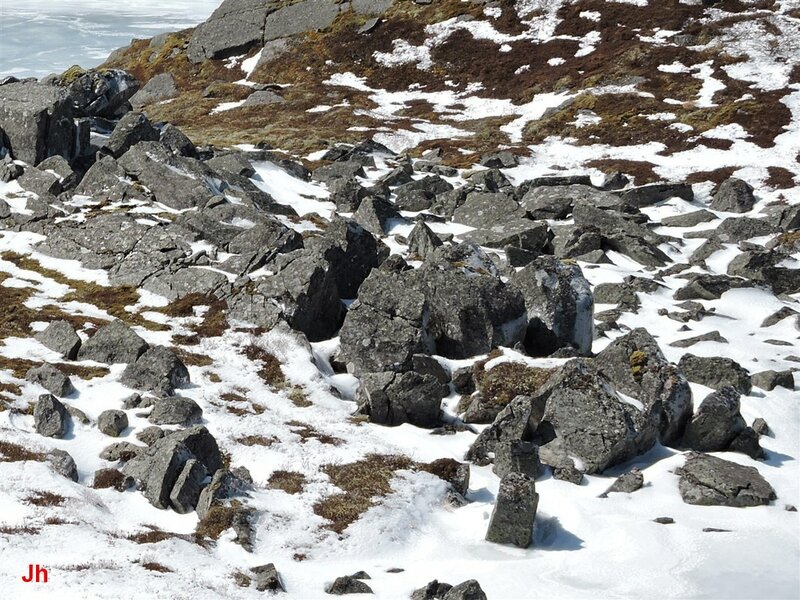 The etched bedding planes are helpful in assessing tilts of ice-displaced blocks. Block "3" is not significantly tilted. The first (left) photo above shows block "4" and adjacent blocks forming the west edge of the large central fissure in IF-07. A closeup of the block lying south (left) of block "4" appears in the second (right) photo. Etched bedding planes visible on this block indicate that this block has tilted top-southward. The above photo shows a view looking southeast at the back of the very large block forming the center and highest point of ice-disrupted ridge, IF-07. This block is not significantly rotated or tilted and appears to have been shifted directly westward by 1 or 2 meters.) The sloping front (seen only edge-on in above photo) conforms with the slope of unshifted bedrock in the ridge. The tape seen in the photo extends 3.5 m and does not reach the (obstructed) bottom of the central block. The above two photos show an ice-carved channel "6" (annotated photo) apparently formed between large block "3" to the south (left) and unshifted bedrock to the north (right). Ice, carrying entrained joint blocks, seems to have punched completely through the ridge at this point. 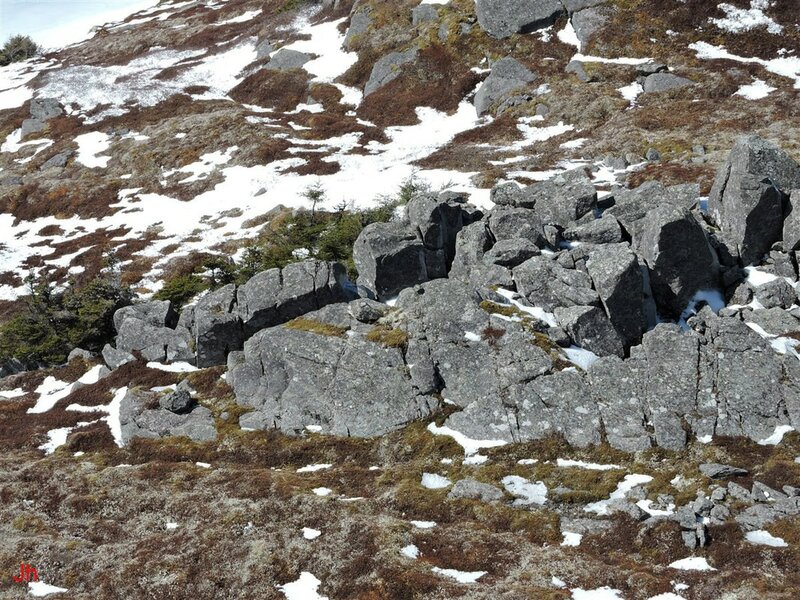 The break-through failure of the ridge in this area appears to be the result of direct mechanical action by glacial ice moving in creep and exploiting well developed and aligned cross joints at the specific location seen above. The above two photos shows large blocks "7" (see annotated photo) that have been rotated top-northward, presumably by moving glacial ice with a significant northward component of creep. 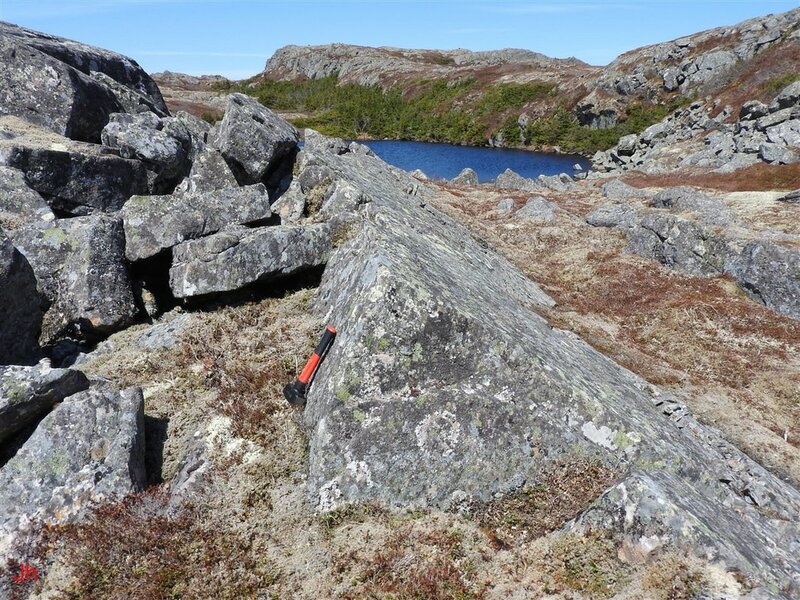 These blocks, seen at the left edge of the first (left) photo, lie on the west (back) edge of IF-07, north of the center of the ridge. The principal mode of failure leading to the large-scale disruption of the bedrock ridge, IF-07 by glacial ice is illustrated above. Ice pressure acting on the ridge, directed westward (for areas north of center) or southwestward (for areas south of center), and with diverging components acting northward and southward caused a linked series of fissures to develop. The fissures combined to allow a large section of the ridge to shift, mainly southwestward, by 1-3 meters. 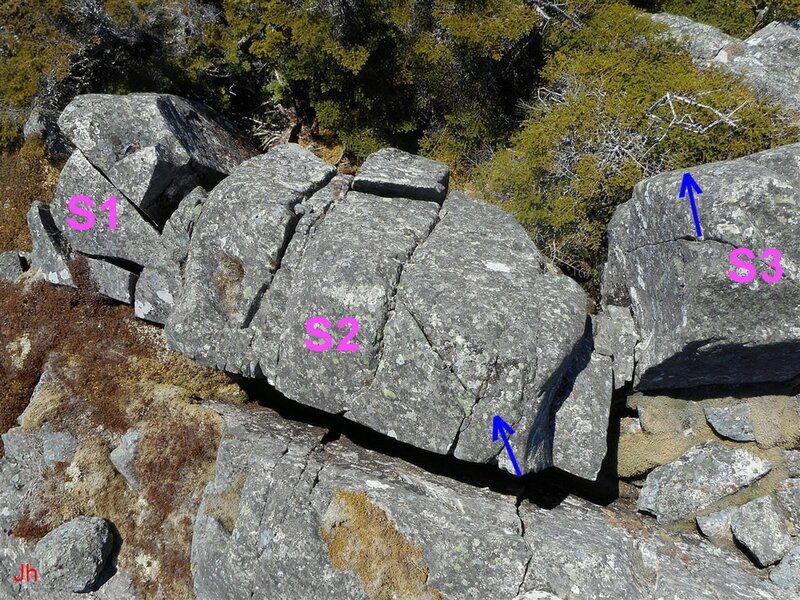 The primary line of rock failure is indicated on the second photo above. 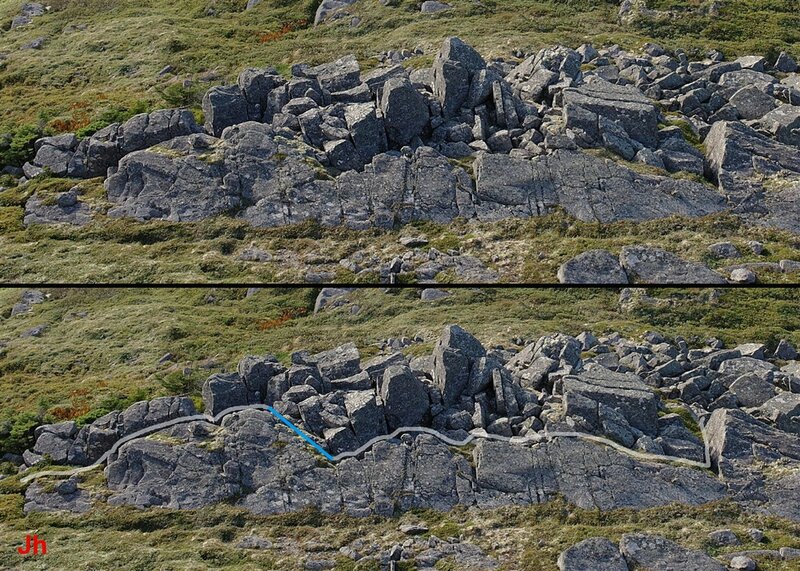 The blue straight line indicates a fault where southwestward-moving rock slid against stationary bedrock. Numerous secondary fissures (not marked above) permitted differential shifting of rock fragments southwestward and westward, as well as the shifting of sections of rock towards the north and south. In the above annotated photo, the light magenta line indicates a large group of blocks that were shifted in a southwesterly direction by ice pressure. The blue arrow, indicating rock shift direction, points approximately 30 degrees south of west (240 degrees true). The prominent fissure (south fissure) just left of the magenta border does not appear to be associated with the movement of rock within the bordered area. This fissure seems to have been formed in a separate event (see "Observations, south section of IF-07"). Views along the east edge of the major line of rock failure are shown above. In most places, rock debris or vegetation obscures the bottom of the failure plane and inhibits measuring depth. 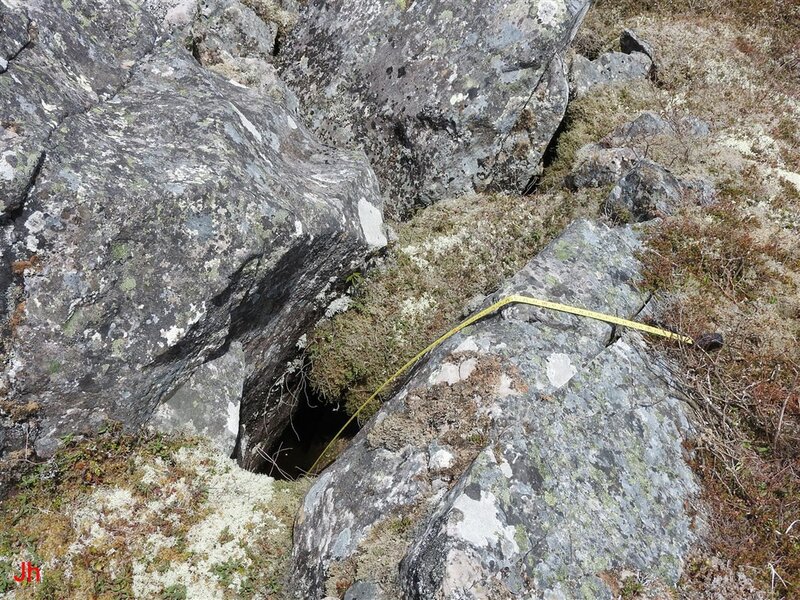 At the location shown in the fourth (bottom, right) photo, a depth measurement was possible, but the measured depth was only a minimum since the tape was obstructed by debris and could not reach bedrock. An overhead view, shown below, provides another perspective on the deepest visible part of the major fissure. 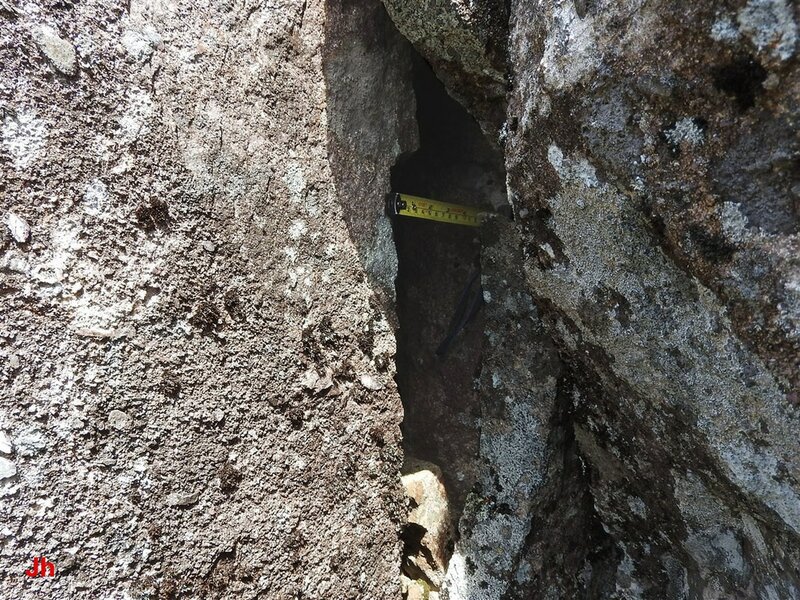 Measurement of the depth of the major fissure splitting the ridge, IF-07, longitudinally showed that rock failure initiated at a depth below the level of the bedrock floor of the small valley lying east of the ridge. This observation is significant because it implies that horizontally-directed ice pressure was acting against subsurface vertically-inclined elements of bedrock. The annotated photo below illustrates the geometry of the depth measurement. 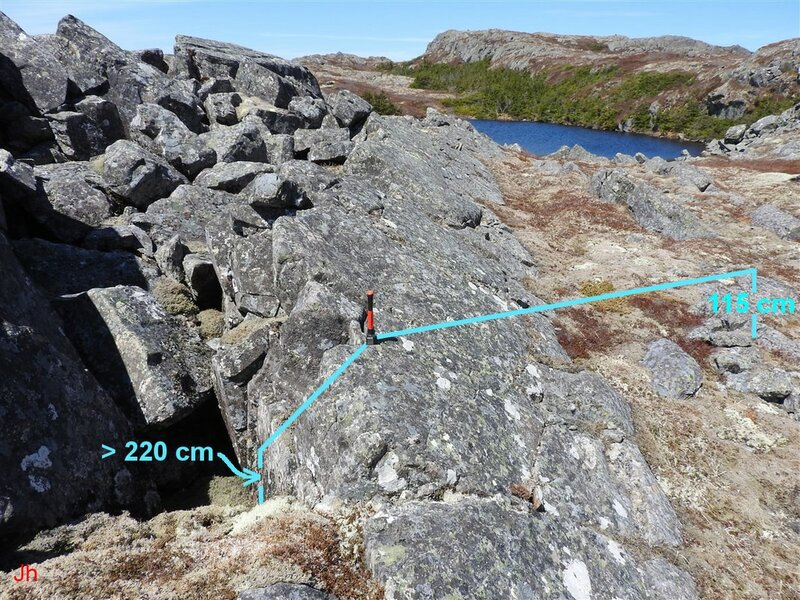 Using the position of the hammer as zero height reference, the bedrock on the valley floor had an elevation of -115 cm, while the bottom of the fissure had an elevation of less than -220 cm. Thus, the basal plane of failure of the rock in a large section of the ridge was apparently more than 1 meter lower than the bottom of the encroaching glacier. This observation points to the transfer of glacial ice pressure at depth, through bedrock (the valley floor) that remained largely intact and unshifted. A simplified diagram illustrating the bulk failure mode of the central section of IF-07 is shown above. The height of the floor of the valley adjacent to IF-07 (east side) is indicated at the left of the diagram. Note that the bedrock floor lying immediately west of the ridge, IF-07, is lower (order of 1 to 2 m) than the bedrock floor on the east side. 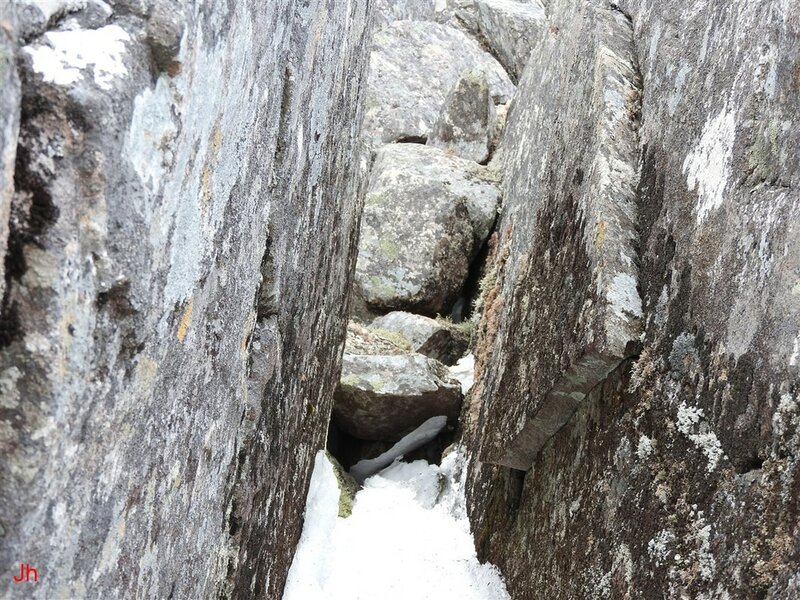 As the gap illustrated in the diagram was opening, a considerable amount of frost-wedged or otherwise broken rock settled into the gap. This is not shown on the diagram. While the diagram suggests that surface mechanical pressure from a glacier acting entirely on the upper portion of the ridge, IF-07, might have shifted a deep-seated block of rock as a monolith, this interpretation is misleading. 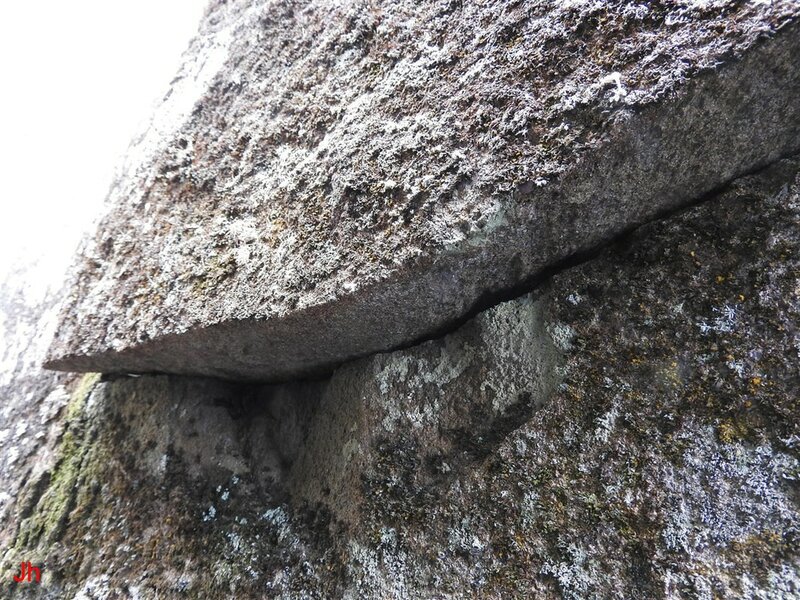 Rather, fissure development occurred repeatedly in a haphazard manner, often leaving tall but narrow detached fragments of rock vulnerable to rotation about a horizontal axis by force applied only at the top. 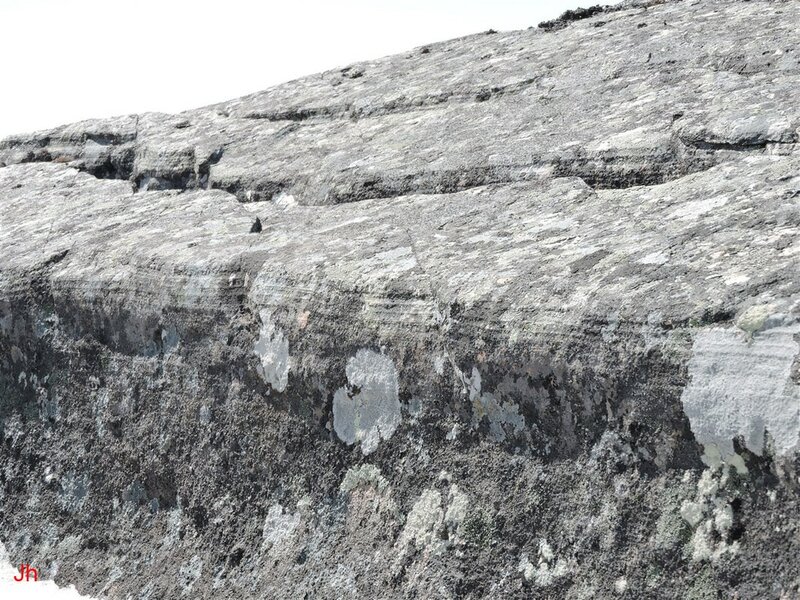 The pattern of rock shifts seen in the central and southern sections of IF-07 rules out situations where ice did not accumulate approximately uniformly, top-to-bottom, in many of the key fissures. The south end of IF-07 is shown in the above west-directed view. Two major fissures are seen in the photograph. The major fissure on the right is discussed above in the preceding section (IF-07 principal failure mode). The major fissure on the left appears to be divided into two sections by a gap visible on the photograph. The perspective of the picture conceals the significant angle between the two sections of this fissure. The sections were likely formed separately, with the section on the right (north) being related to the large shift of rock along the line 240 degrees true (see above, IF-07 principal failure mode). The section on the left, the "south fissure" is discussed separately below and its origin is attributed to the action of ice pressure transferred through nearby unshifted bedrock. The annotated photo below identifies the main components of the south end of IF-07. 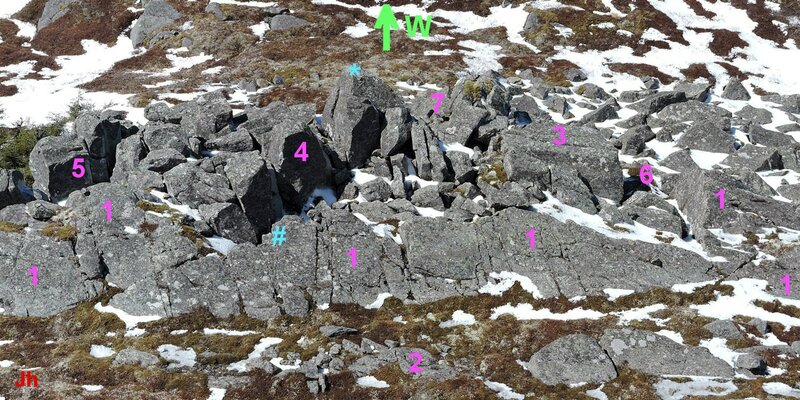 Referring to the above annotated photo, S2 is a free-standing intact block of ice-shifted rock, while S1 and S3 are both groups of blocks of ice-shifted rock. The "south fissure" runs along the front (east) of block S2, between the indicated magenta lines. 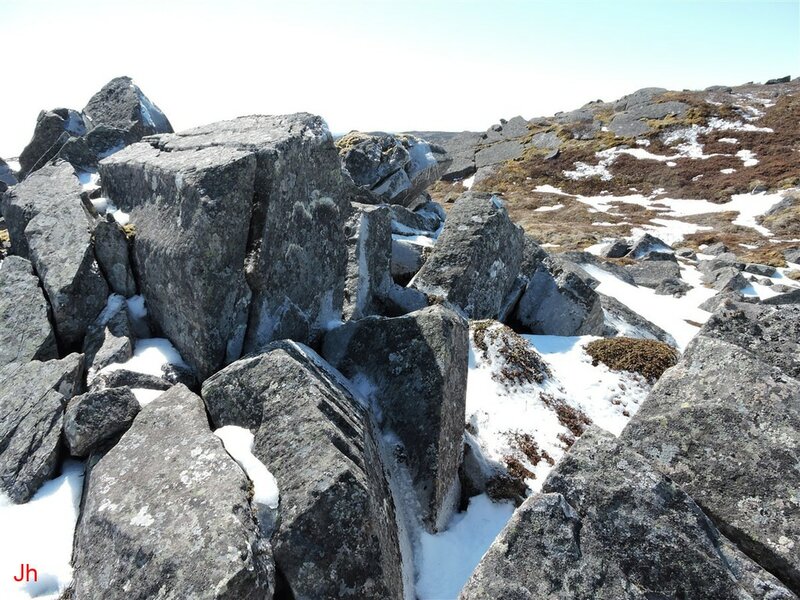 The geometry of the blocks in the group, S3, implies that these blocks were not shifted into position solely by the mechanical action of glacial ice acting at the tops of the blocks. 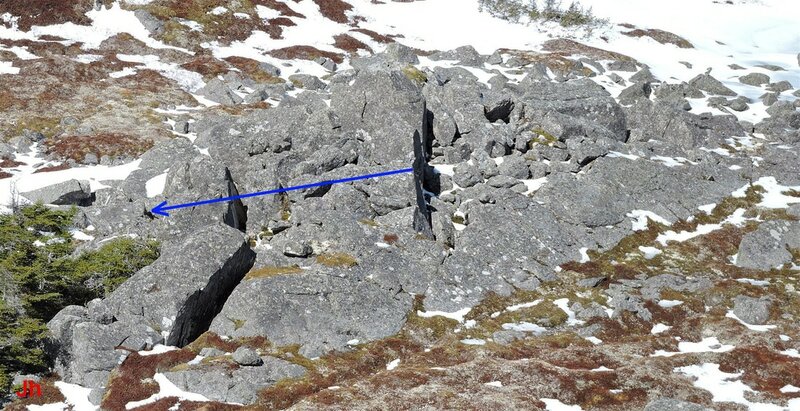 The blue arrow drawn on the above photo shows the apparent direction (240 degrees true) of ice pressure acting to displace a large section of rock, including the group of blocks, S3. The blocks, S3, appear just to the right of the head of the arrow. Note the fissure to the right (east) of the blocks. This deep, narrow fissure separates the blocks, S3, from another large ice-displaced group of blocks seen to the right (east) of the fissure. The two photos above show views of the blocks, S3, and the fissure running adjacent to these blocks on the east side. The first (left) view looks approximately north, while the second (right) view looks approximately west. The taller of the blocks in the group, S3, extend about 2.5 m top-to-bottom as viewed in the second (right) photo. The group of ice-displaced blocks, S3, appears on the right in the above south-directed photo. The hammer lies in the fissure running east (up-ice) of the group of blocks, S3. The large block in the center foreground of the photo is bounded on the west side by a curved failure plane terminating in an overhang at the top. 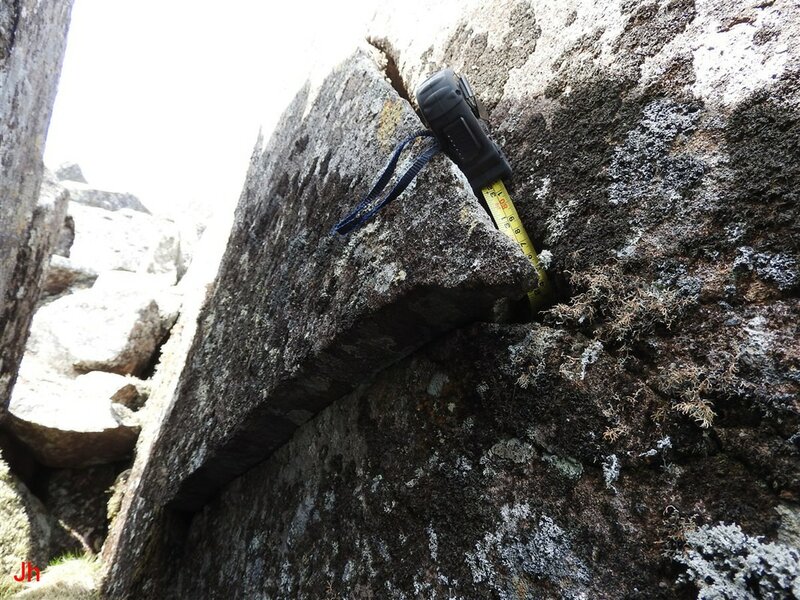 This block is 45 cm thick in the middle and the top stands about 2.5 m above the hammer and 3.5 m above the ground on the west side. Clearly, the foreground block is the remaining fragment left behind following the failure of a thicker precursor block. The two blocks standing directly behind (south of) the front block indicate the thickness of the precursor to the foreground block. 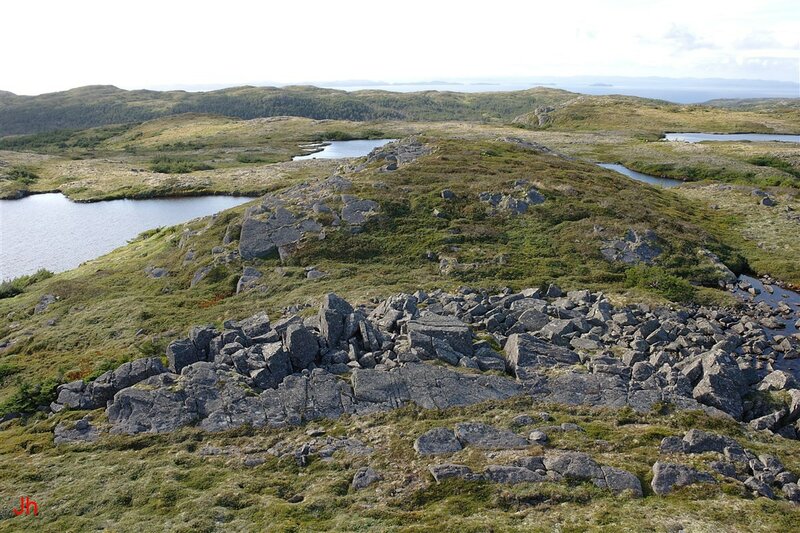 The precursor's thickness was 1.5 m. The missing fragment could not be recognized, but probably includes one or both of the large blocks seen lying on the ground to the west (right on photo) of the still-standing fragment. 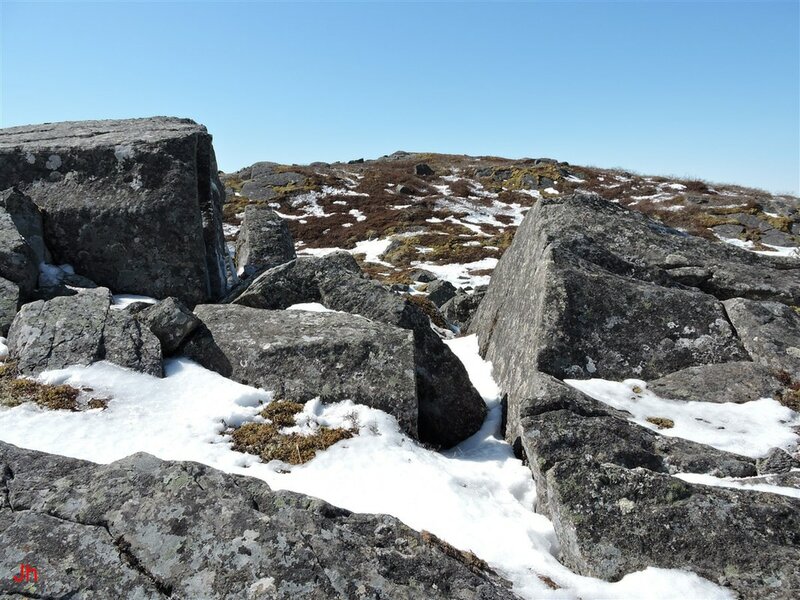 Both of the fallen blocks are positioned so as to rule out freeze-thaw weathering and settling as the cause for their separation and transport. The section of rock missing from the foreground block was shifted away from this block by ice movement in a subglacial environment. The above photo looks east at the west face of the group of ice-displaced blocks, S3. The large blocks at the left side of the photo are not part of the group, S3, but rather form the end of an east-west line of blocks that have been rotated top-westward by glacial ice moving west (toward the camera) over the top-central portion of the ridge, IF-07. 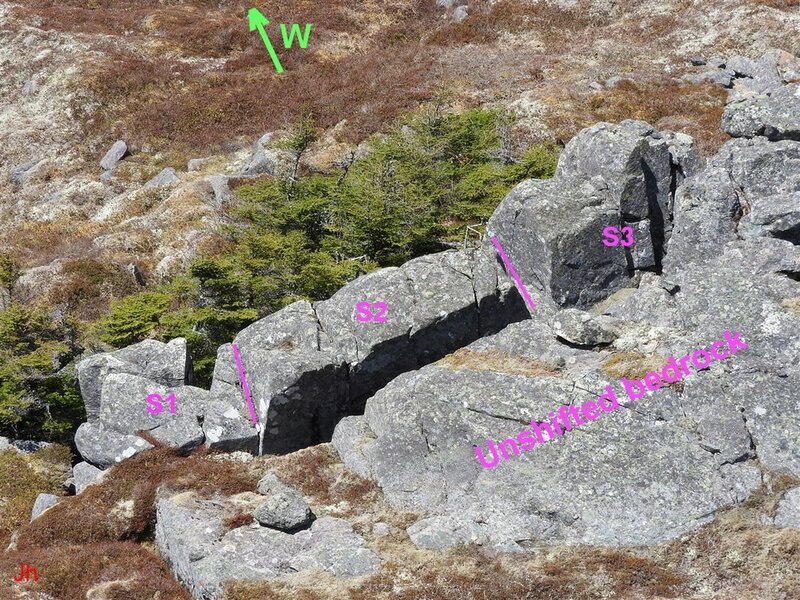 After a gap, the next block seen to the right of the rotated blocks is also not part of the group, S3, but forms the east wall of the fissure running alongside the group, S3 (see above). The next set of blocks, belonging to the group, S3 extend as far as the dead tree seen to the right of the photo. The rock visible beyond this point is the west face of the ice-displaced block, S2. 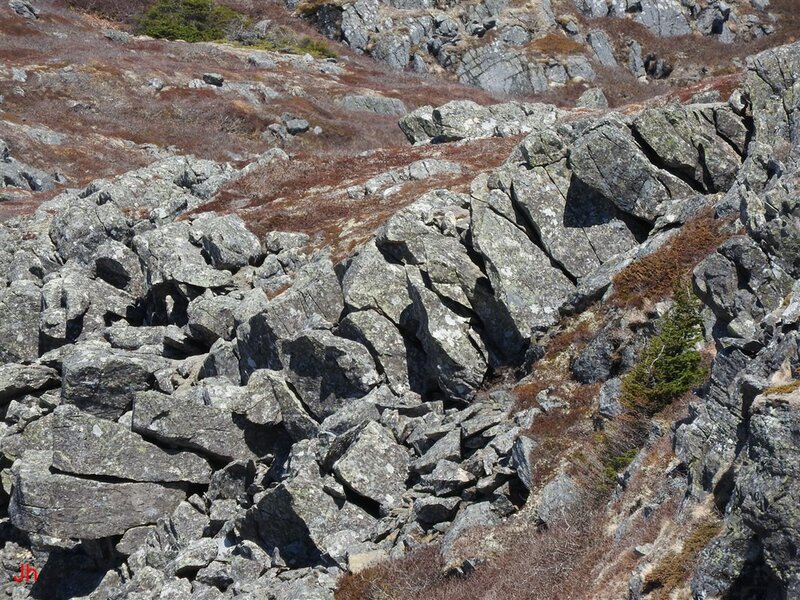 Much of the rock surface seen in the above photo is the glacially smoothed, but steeply inclined west face of the precursor ridge to IF07. 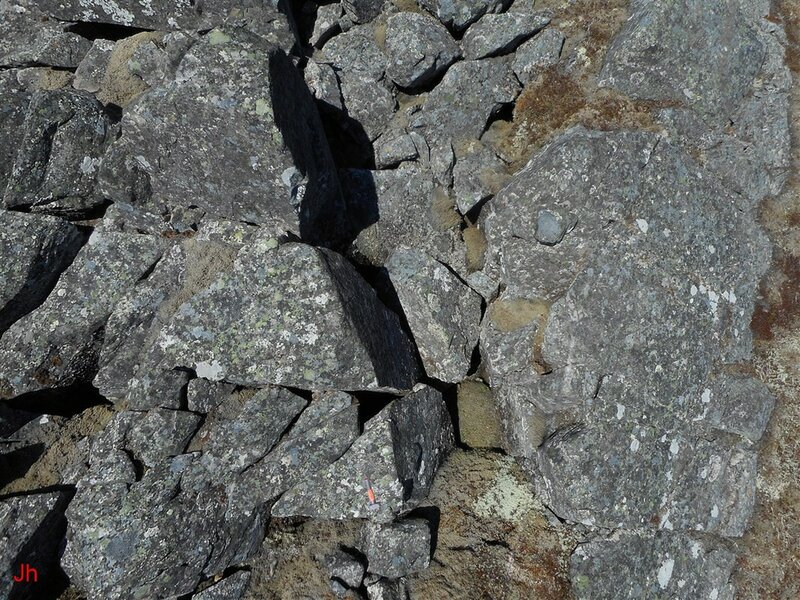 This less disrupted rock surface includes the surface of the block that juts out between two plucked sections of rock, along with rock surfaces to the south (right) of the rightmost plucked block. Why are the ice-displaced blocks in the group, S3, not rotated top-westward? The aspect ratio of these blocks (taller than they are thick) would favor tilting or toppling of the blocks by glacial ice moving overhead. 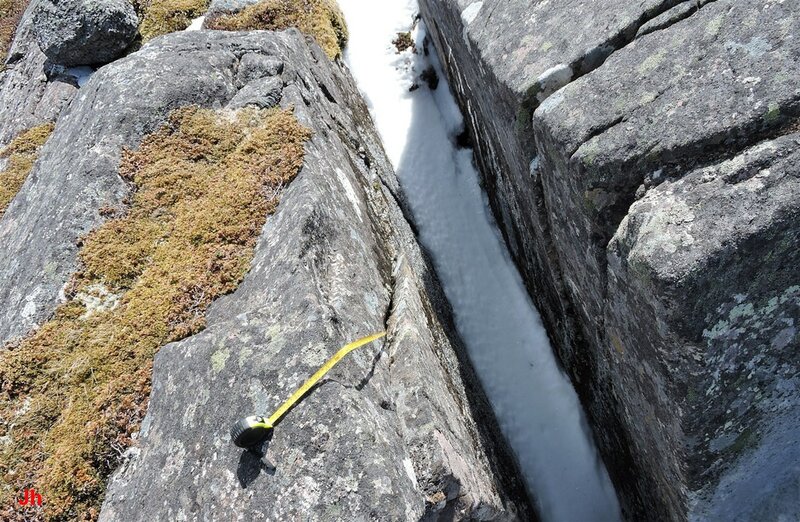 How did ice enter the narrow fissure lying adjacent to the group of tall blocks, S3? If glacial ice entered from the top, via creep, as the fissure opened, why is the top of the fissure not significantly wider than the bottom of the fissure? Answering the preceding questions requires understanding how west-directed glacial plucking of the central section of the ridge, IF-07, progressed. The only model that seems consistent with observations is a model where cold ice is assumed to, in effect, move through sections of rock as well as to move around and over sections of rock. Within this model, the rate at which cold ice moves through the rock must be similar to the rate of creep in cold ice moving external to the rock. If either mode dominated, the intermixing of observed hybrid rock shifts (partial rotations and horizontal shifts) would be unexpected. Note: The term "cold ice" as used here refers to ice which does not enter the liquid phase at any point in the process leading to bedrock disruption and shift. In the model being considered here, ice not only emerges from unshifted bedrock, but also enters and reemerges from large ice-displaced sections of rock embedded in the overall flow. The above photo shows a view of the "south fissure" (mentioned earlier in this section and marked on the previously presented outline map). The rock lying to the right (east) of the fissure is unshifted bedrock. All rock seen lying to the left (west) of the fissure has been shifted both westward and southward by ice pressure. The fissure is 2.7 m deep and 0.5 m wide. Note the hammer laid on the rock just to the right of the fissure. Another view of the south fissure is shown above. 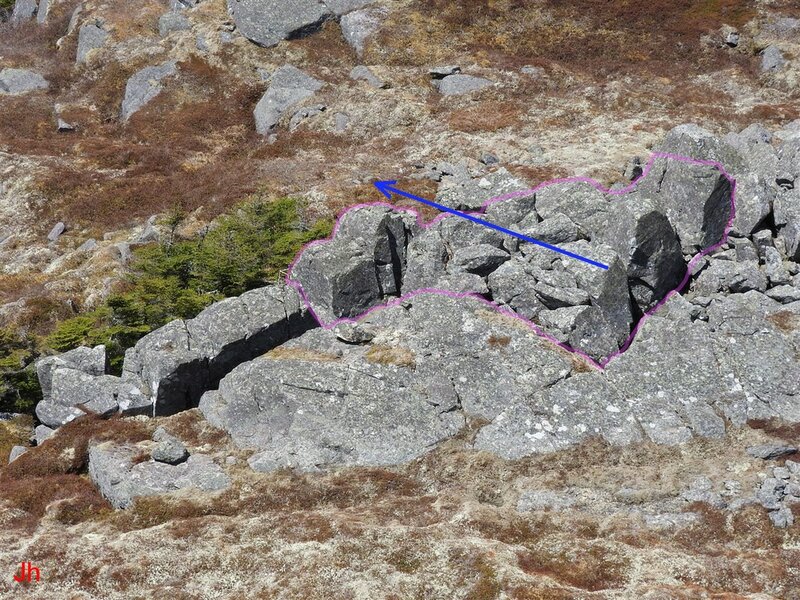 The block seen west (left) of the fissure is the block, S2, as labelled on a preceding annotated photo. This block is 3.2 m long (parallel to fissure) and about 1.1 m wide on the upper surface visible in the photo. The top surface of the block, S2, and the surface of the block curving back toward the west are both surfaces of the precursor glacially-smoothed ridge, IF-07. The first (left) photo above shows block, S2, and the south fissure. The second (right) photo above highlights the contact between block, S2, and the southern end of the group of blocks, S3. While it cannot be determined whether the shifting of the blocks S2 and S3 occurred simultaneously or in sequence, the two shifts appear to represent the action of two differently-directed ice streams (see "IF-07 principal failure mode" for description of S3 shift). Block S2 appears to have been pushed directly westward by ice accumulating in the south fissure, although this block also has a southward component to its shift. This southward component could have resulted, in part, from interaction between blocks S2 and group S3. 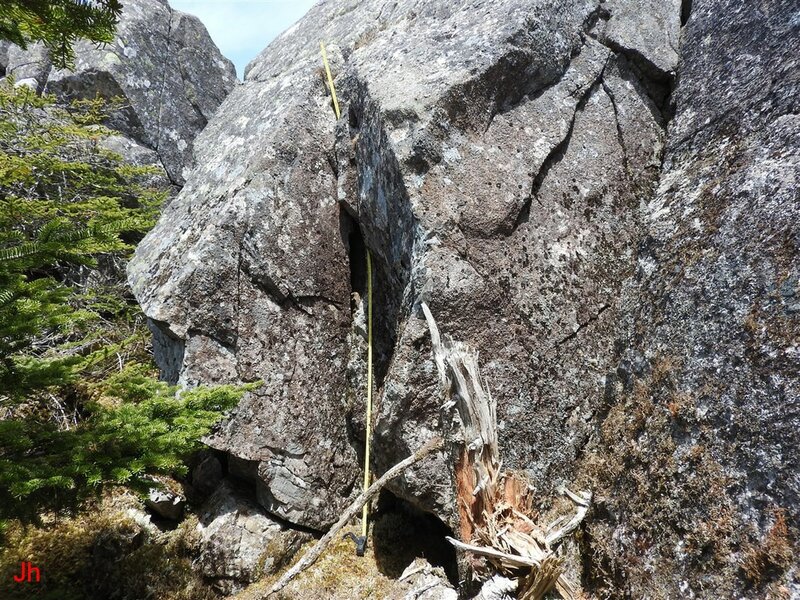 Measurements indicated that block S2 shifted 51 cm west and 56 cm south relative to unshifted bedrock on the east side of the south fissure. The directions of shift of blocks S2 and S3 relative to adjacent bedrock are indicated by the blue arrows on the above annotated photo. The arrows do not show magnitudes of the shifts. The magnitude of the shift for the group of blocks, S3, was not measured because the original position of the S3 blocks could not be determined. The shift was estimated to be of the order of 2 m in the direction 240 degrees true. The shift of the block S2 was 76 cm in the direction 230 degrees true. Block S2 showed no evidence of rotation about a horizontal axis, indicating that mechanical force imparted by glacial ice moving across the top of the block played little role in shifting the block. Furthermore, the bottom of the south fissure running alongside block S2 lies more than 1 m below the bedrock floor of the valley immediately up-ice (east) from S2. The block, S2, thus appears to be a glacially plucked feature, shifted primarily by the frost-wedging action of ice accumulating in adjacent fissures. The above two photos show a glacially plucked feature on the west side of ice-shifted block, S2. The tape extends down 2 m from the bend at the top of block S2 and terminates at the top of a large block that has been frost-wedged outward. This plucked block has not rotated about a horizontal axis. Rather, the block has shifted 15 cm straight westward relative to block S2 (note that block S2 is a shifted frame of reference). The first (left) photo above shows the plucked block on the west side of block S2. The tape, extending from the ground to the top of the plucked block, reads 2.4 m. The second (right) photo above shows a closeup view of an exposed part of the fissure running behind the plucked block. 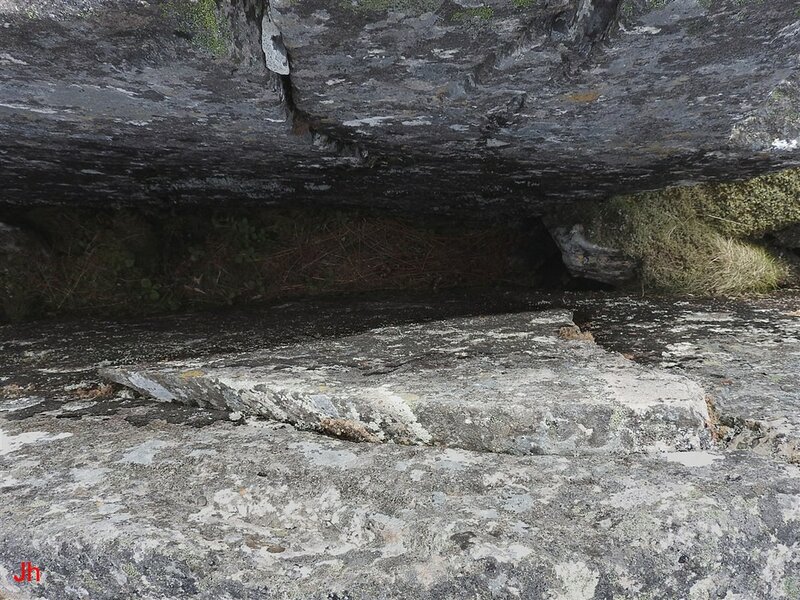 The fissure is vertical and of roughly uniform width top to bottom, 15 cm. The bottom of the plucked block shows evidence of additional erosion by plucking, as does the side of the large block, S2, seen in the right foreground of the first (left) photo above. The plucked fragments not still attached to block S2 could not be recognized because of a thick growth of trees intruding into the region of interest. 1) Direct mechanical action by moving glacial ice is eliminated as a cause for its displacement. 2) Plucking via regelation is eliminated as a possible originating factor because the pressure reduction needed for water refreeze is not achievable in the confined space of a narrow fissure. 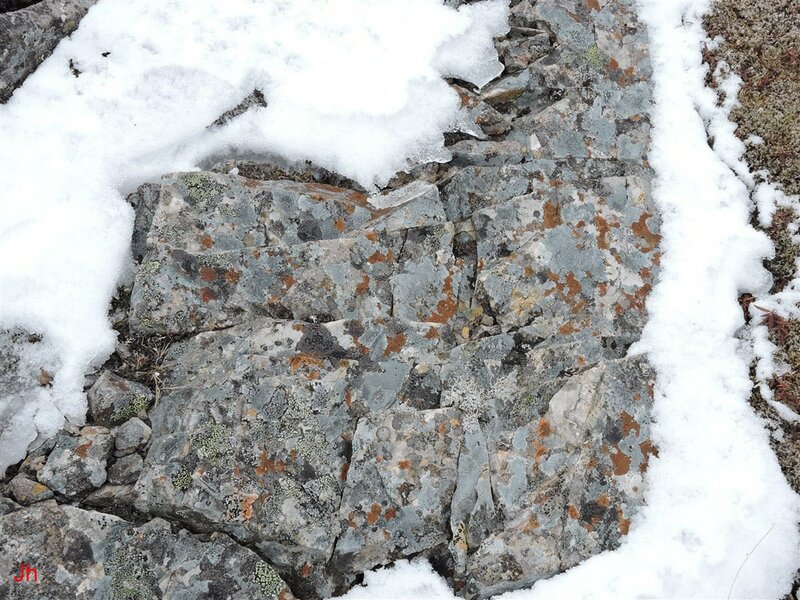 3) Subaerial frost wedging in a periglacial environment is improbable in light of the geometry of the rock displacement (normal to weather-induced thermal gradient), the ample drainage observed behind and beneath the displaced block, and the conformance of the direction of displacement (westward) with other displacements of plucked fragments at this location. The photos below show additional views of the frost-heaved joint block. The tape seen in the above photo reaches 46 cm into a sloping gap behind the plucked block. The joint block is roughly tetrahedral in shape. The exposed west surface of the plucked joint block formed an approximate equilateral triangle with side lengths 94 cm, 112 cm and 120 cm. The block was displaced outward from the wall of the fissure by 7 cm. 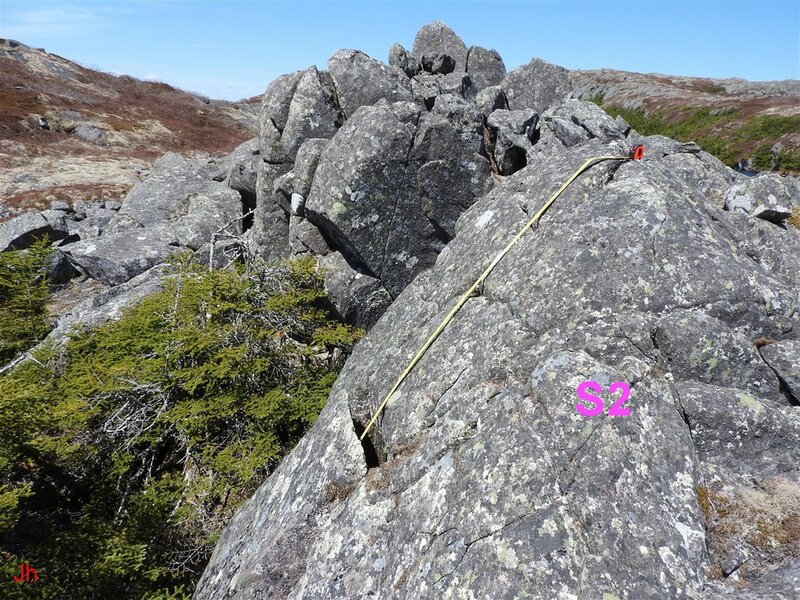 The best estimate for the distance from the exposed west face of the tetrahedral block to the apex (extending east into the bedrock) was 65 cm. 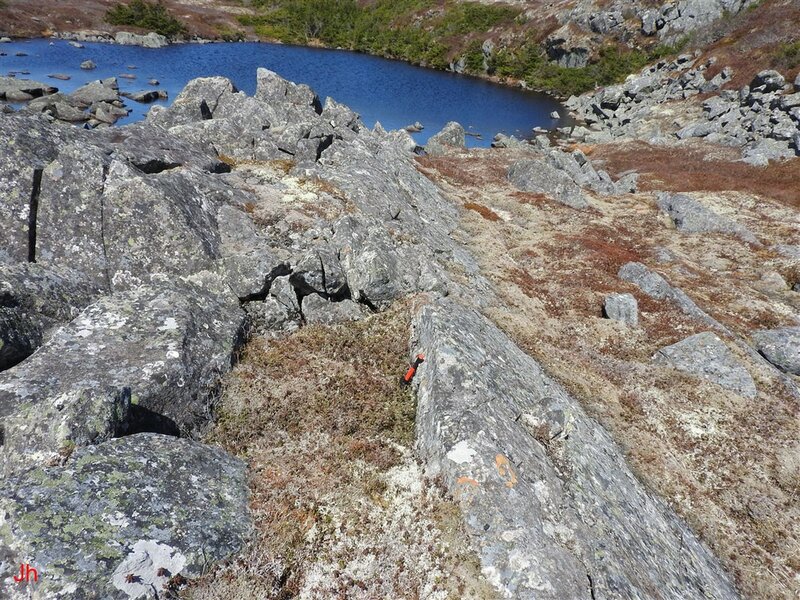 The highest corner of the plucked block lay 20 cm below the adjacent bedrock surface on top of the east side of the south fissure. 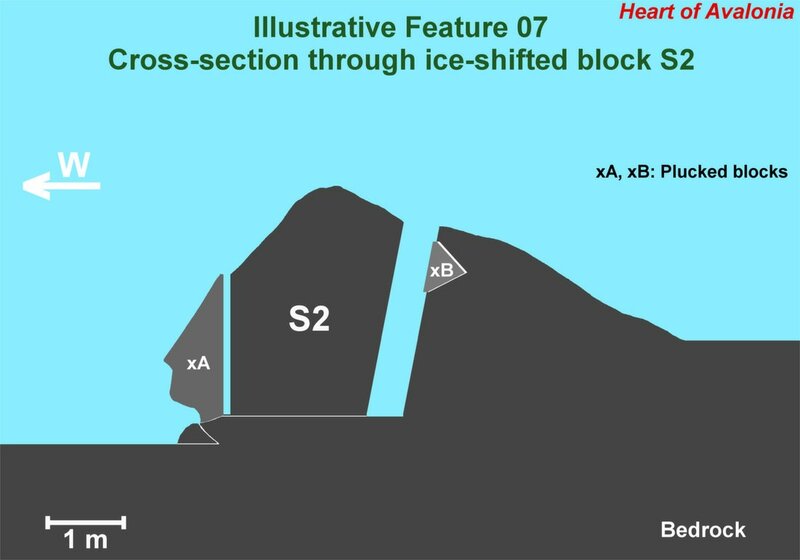 The above scaled profile diagram shows the south fissure, the large ice-displaced block, S2, and two subordinate plucked blocks, xA and xB. The blocks, xA and xB are the blocks that were illustrated and discussed above. The diagram appears to indicate that block, xA, lies due west of block, xB, but these blocks are not in east-west alignment. Block, xA, is southwest of block, xB. The diagram also does not indicate the 56 cm southward shift of block, xA, shifted in exact correspondence with block, S2. The key question posed by the above-illustrated arrangement of plucked bedrock sections is: How did ice enter the space behind each displaced section of rock? Conceivably, mechanical action (ice loading) by an overhead glacier could cause the opening of the fissures separating xA from S2 and S2 from adjacent unshifted bedrock. Once opened, then ice creep directed vertically into the fissures could widen them. Within this model, it is hard to explain why blocks xA and S2 would not rotate top-westward. This argument repeats the arguments made previously regarding the shifting of blocks that are tall relative to their thickness. It is difficult to conceive how direct glacial action could displace block, xB, westward without disrupting the bedrock lying immediately east of xB. 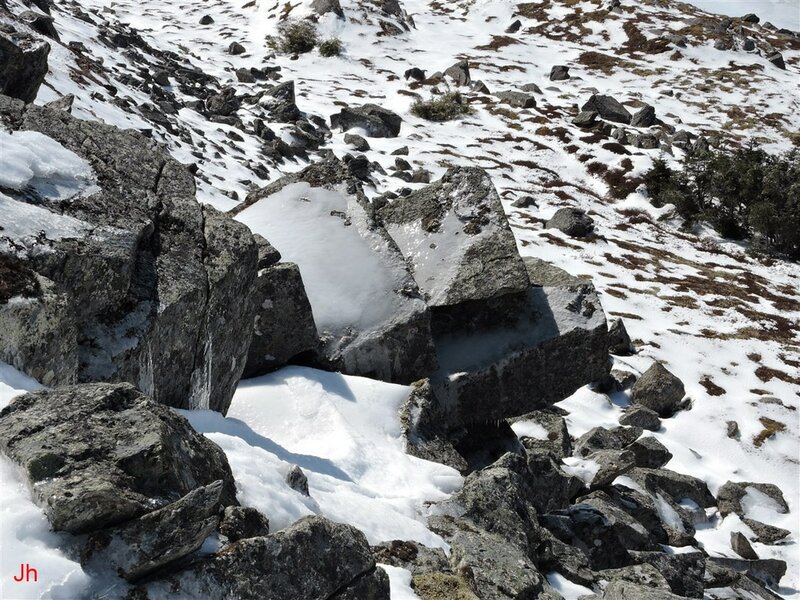 The observed shifting of this block appears to demand that glacial ice enter the bedrock nondestructively (see photo below) and reemerge in the space behind xB. If this process is accepted as the explanation for the displacement of block, xB, then it is reasonable to assume that a similar process might account for other shifts of bedrock fragments comprising the ice-disrupted ridge, IF-07. The relative timing of the shifts of blocks, xA and S2, is worth considering. Did block, xA, separate from block, S2, while block, S2, was still attached to bedrock? In this case, the process of shifting block S2, might be expected to twist or otherwise disturb the position or orientation of xA relative to S2. It appears more likely that block xA separated from block S2 after block S2 finished its motion. In this instance, ice from the south fissure would need to enter the east side of block, S2, and reemerge from the west side of this block to cause the observed plucking. 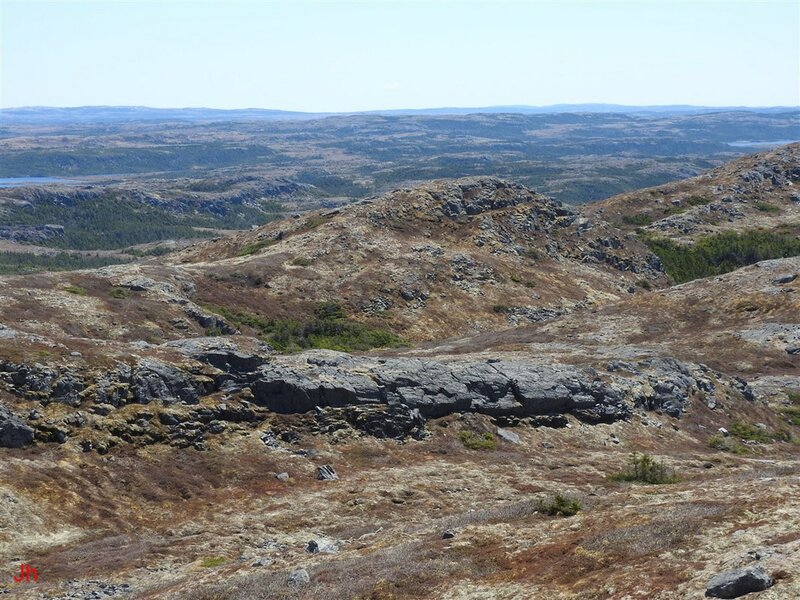 The above photo shows unshifted bedrock immediately east of the south fissure. The fissure can be seen in the background. 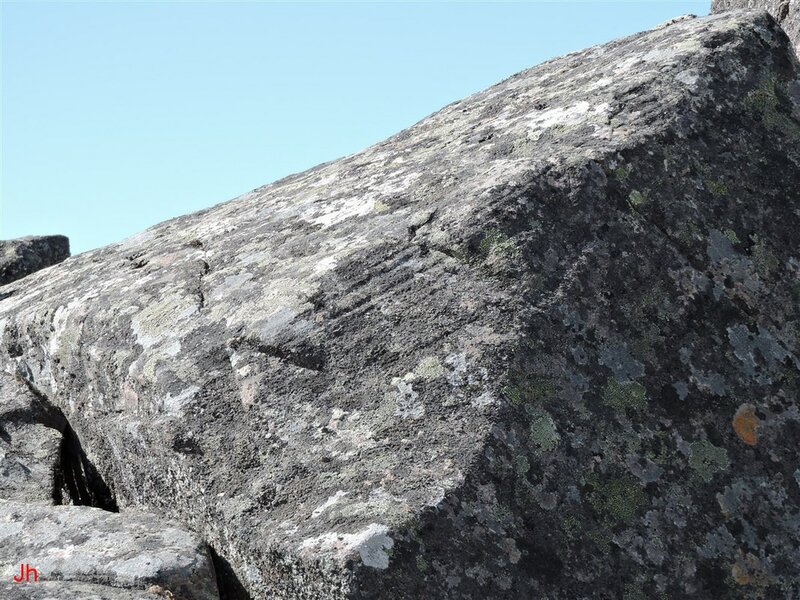 Although the sedimentary bedrock seen in the photo is foliated and contains cross joints, there are no obvious points of entry for the glacial ice that appears to have penetrated this rock and caused plucking on the other side. As discussed above, the geometry of this bedrock arrangement does not favor plucking via regelation. 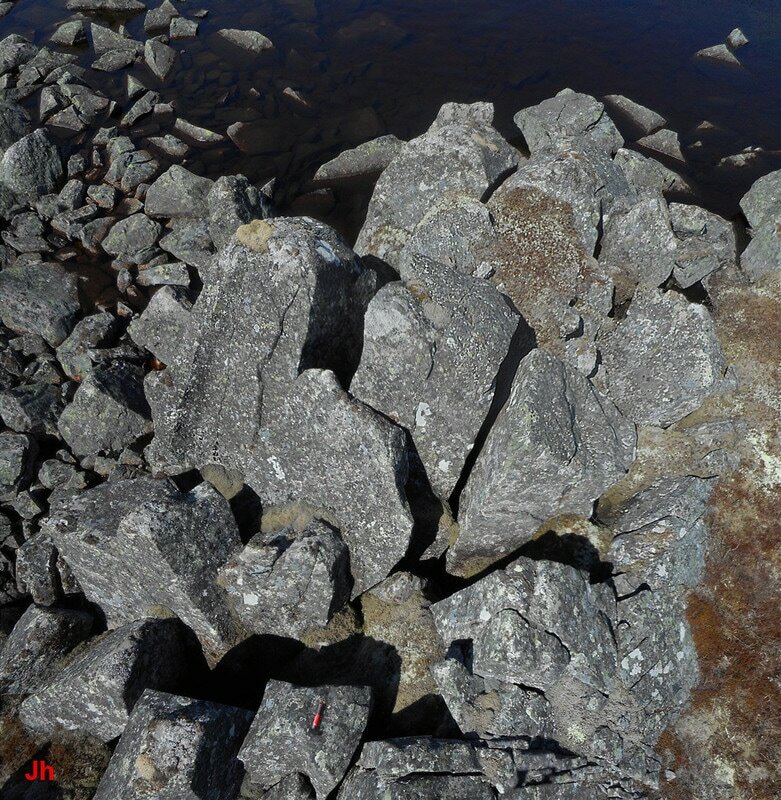 The above photos show the group of ice-displaced blocks, S1 (see previous annotated photo). The first (left) photo shows the blocks, S1, along with the south end of the south fissure and the south end of block, S2. The blocks, S1, were apparently shifted southwest in conjunction with the shift of block, S2. They were then further shifted as seen in the photos. As with ice-shifted blocks seen on the north end of IF-07, the separated blocks, S1, seen above appear to have resulted from the fragmentation of a once-unified section of bedrock. The block with the hammer on it is 1.2 m across at the top (longest dimension) and stands 2.5 m high. The block immediately west (above in photo) of this block has been shifted 35 cm in a direction 205 degrees true relative to the adjacent block. Although only the relative shifts are noticeable in the photographs, presumably all of the blocks, S1 and S2, were also shifted together as a single ice-encased unit. The horizontal shifting of these tall blocks, without any significant tilting, suggests their entrainment in a diverging ice stream that was moving via creep. The creep velocity at the bases of the monoliths approximately matched the creep velocity at the tops. It is difficult to explain this homogeneity of the creep velocity profile without assuming that ice, in effect, moved through the blocks and through the adjacent bedrock. This transfer of ice through rock occurred at a rate comparable to the rate of ice creep in the glacial ice surrounding the blocks. 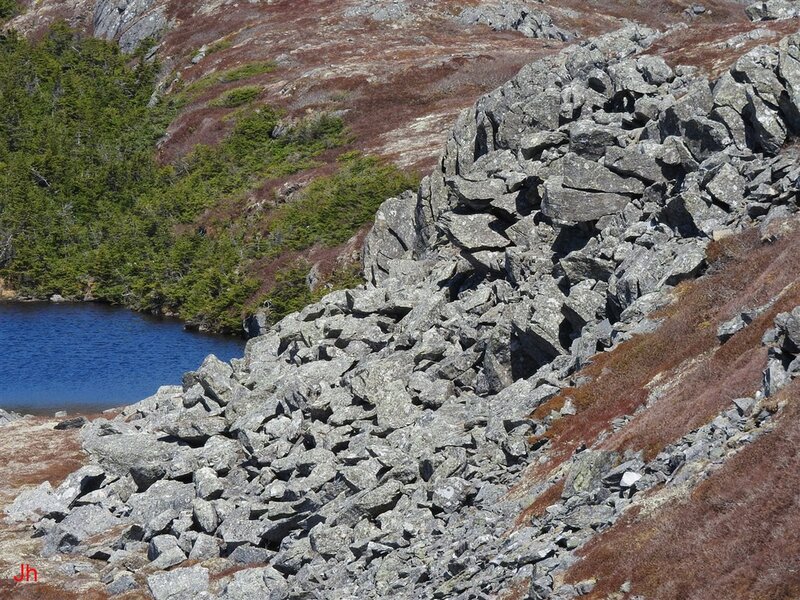 The above photo shows glacially plucked bedrock lying south of the south end of the ridge, IF-07. The south fissure can be seen to the right in the background of the photo. 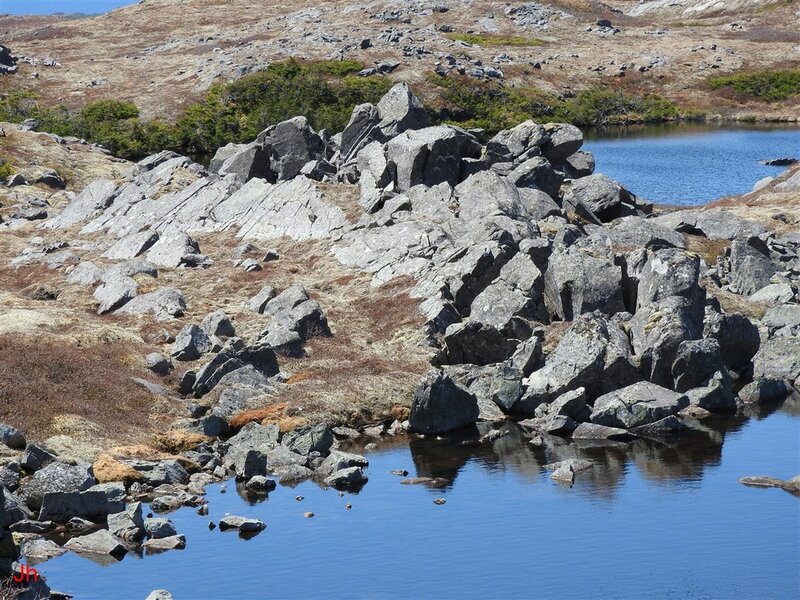 The fissure visible in the group of foreground rocks is 45 cm wide. 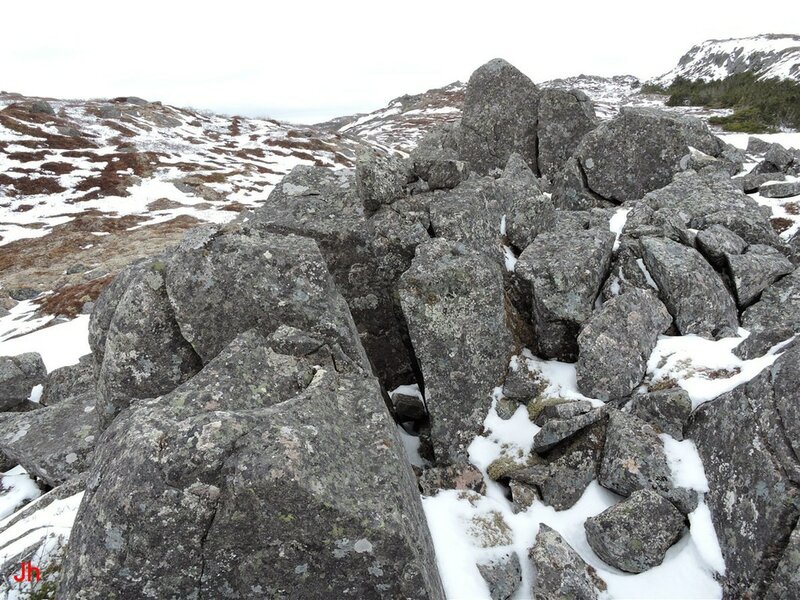 These foreground plucked rocks are a continuation of the general trend of ground-level or below-ground horizontal frost wedging seen in IF-07. The above photo, looking southeast, shows the northwest side of IF-07 in the foreground and the major ridge lying east of IF-07 in the background. The major ridge shows evidence of glacial plucking on its west side at several locations along its length, but the severity of the plucking reaches a maximum just east of IF-07. The disrupted rock slope seen in the background of the above photo resembles a rockfall or an occurrence of mass wasting. However a closer look at the feature, particularly at the upper levels, reveals that this feature is an example of "restricted plucking" as defined in the discussion of Illustrative Feature 05. The above photo illustrates the essential elements of a relict bedrock glacier apparent on the west slope of the ridge just east of IF-07. The bedrock glacier feature begins at the skyline on the right side of the photo about two thirds the way across the frame. Intact bedrock is seen giving way to bedrock with fissures, which then gives way to blocks rotated top-westward about a horizontal axis. Beyond the rotated blocks, a more disorganized pattern emerges, incorporating blocks that became completely dislodged and shifted down-slope while entrained in ice. 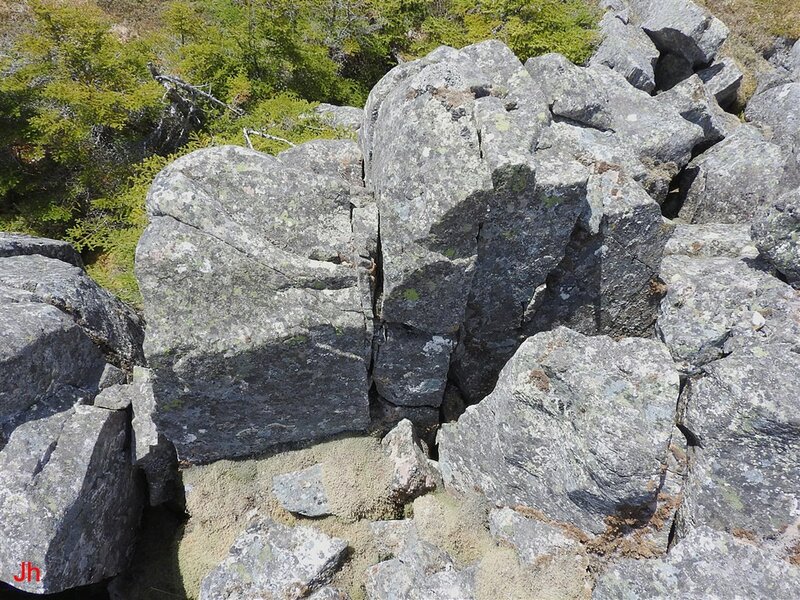 However, all the way to the bottom, observations show that fragments found near to one another are generally sections of rock that were divided from larger precursor sections. 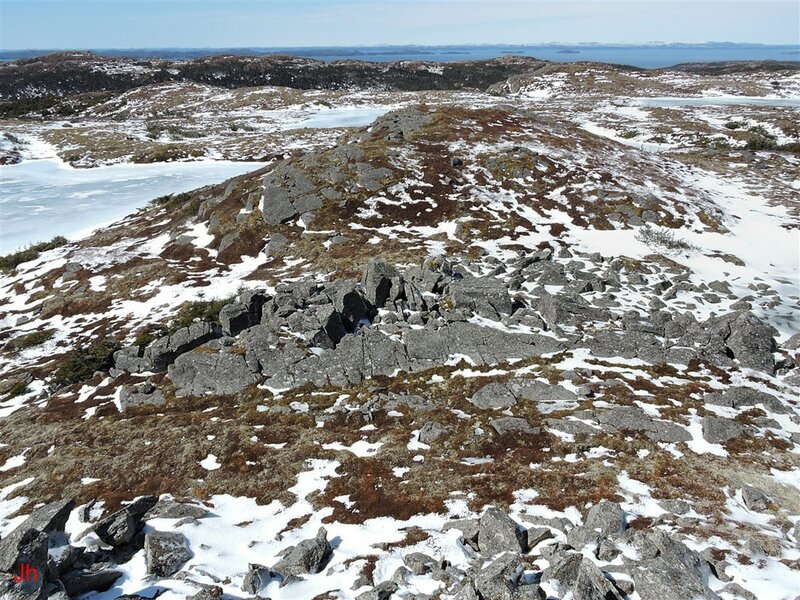 There is little evidence of any rock having been transported by ice to points beyond the base of the slope seen in the above photo. 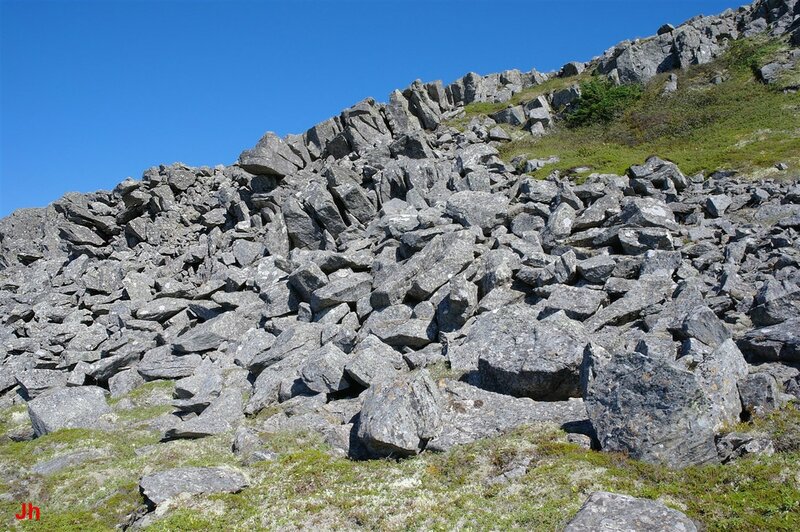 Notice how the dispersed rock fragments appear to fan out from a concentrated area of rock disruption at the top of the hill. The photo preceding the above photo also illustrates this geometry. The observed spreading of the distribution of ice-shifted blocks might relate to the diverging pattern of ice creep discussed previously in relation to IF-07 (see "Theory regarding the secondary stage of erosion of IF-07" above). 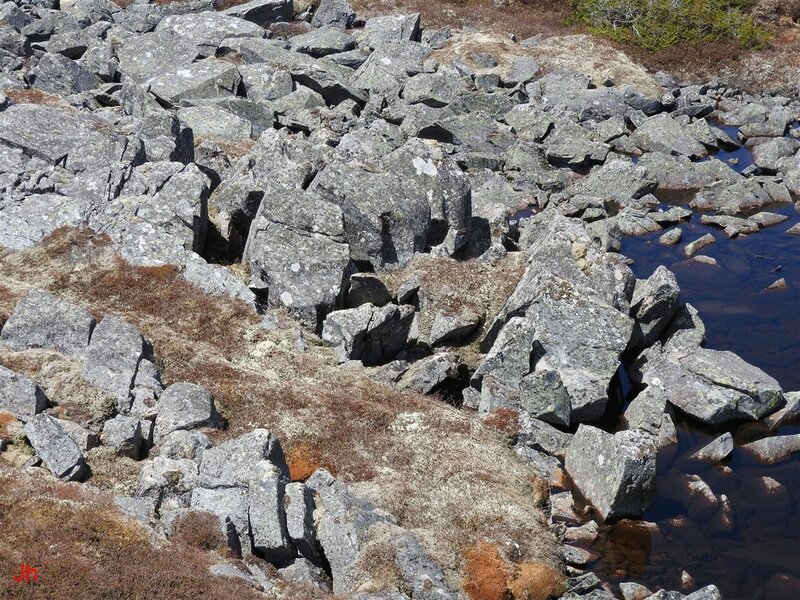 The above photo shows sections of plucked bedrock that are rotated top-westward about a horizontal axis. 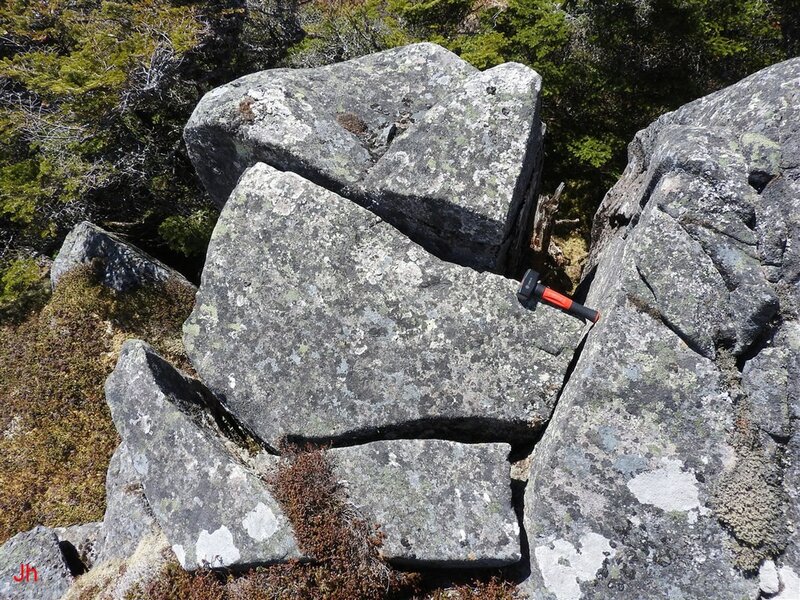 This precarious arrangement of plucked blocks that were rotated but not shifted significantly at the base is indicative of subglacial bedrock disruption with limited cumulative ice movement before final deglaciation. The velocity of ice creep across the tops of the blocks exceeded the velocity of ice creep at the base. This is an expected occurrence on a steep down-slope where gravity-induced stress favors rapid creep of unobstructed glacial ice. Since ice creep at the base of the blocks can only result from non-tangential ice flow, that is, from ice flow emanating from within the bedrock, this creep is rate-limited by bedrock permeability. The geometry on the slope contrasts with that on IF-07 below, where non-tangential ice flow velocities appear to have matched or exceeded glacial creep velocities at several (roughly horizontal) locations. 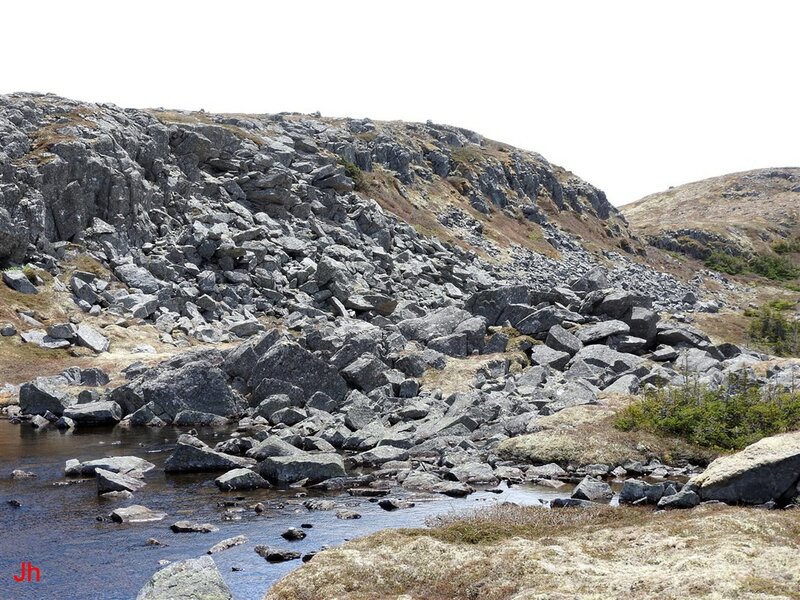 In spite of the lower relative component of non-tangential ice flow velocity evident on the slope pictured above, non-tangential ice flow was likely significant and was probably instrumental in initiating the severe plucking evident in this relict bedrock glacier feature. The two photos appearing above illustrate the intense plucking on the west side of the ridge immediately east of IF-07. The views are from the south, looking north. The first (left) photo shows the upper section of the bedrock glacier, while the second (left) photo shows the lower section. The photo below shows an overview of the scene viewed from the south. While it is uncertain as to whether there is any direct association between the bedrock glacier shown above and the ice-disrupted minor ridge, IF-07, the two features have several elements in common. Geographically, the above-pictured bedrock glacier lies directly on the assumed east-to-west ice path leading to IF-07. Only a shallow and narrow valley separates the two features. Both features illustrate intense bedrock disruption by ice where the disruption was characterized by very limited cumulative rock displacement. There are other plucked features along the west side of the major ridge east of IF-07, but none of these other features approaches the size and severity of the relict bedrock glacier feature pictured above. If the above-described feature were to be directly associated with If-07, then the association might relate to enhanced pressure of ice/pore-water in a localized region of bedrock, or it might relate to a zone of enhanced bedrock permeability. Also, specific details of the local glacial topography in the period just prior to deglaciation could have played a role in concentrating ice pressure/flow in the area immediately east of IF-07. 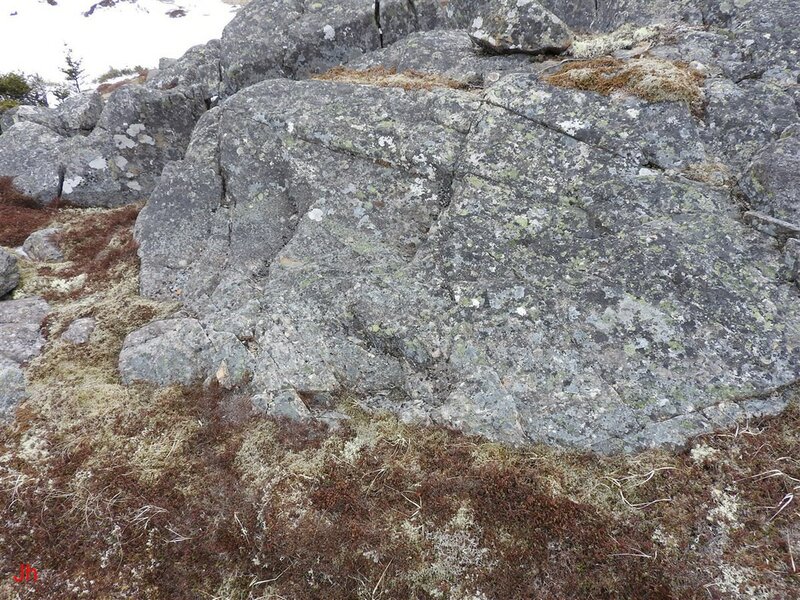 The above photo shows a sample of rock from the ridge, IF-07. The field of view in the photo is about 30 cm wide. 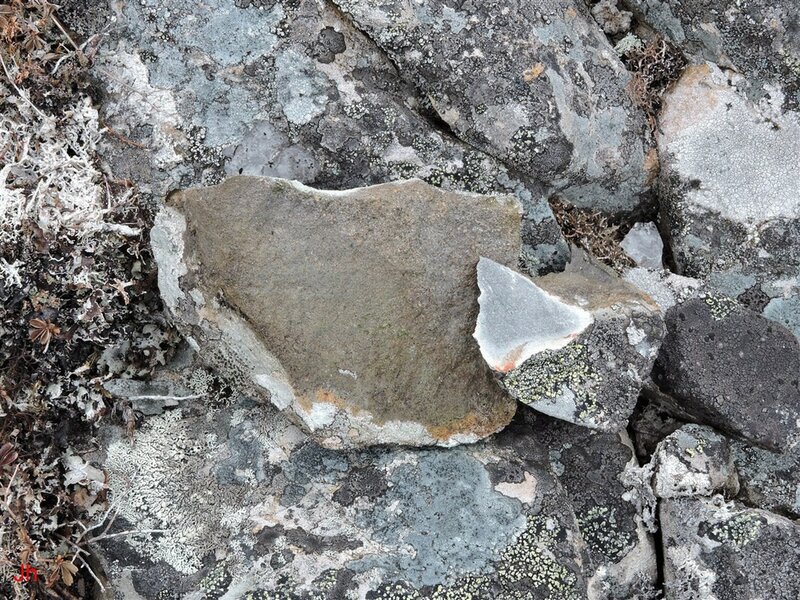 The rock fragment on the left shows a weathered surface, turned over to expose a surface not covered by lichen. The rock fragment on the right was chipped from the fragment shown on the left. The rock type illustrated in the samples appears to form most of the volume of the ridge, If-07. Visual inspection of the rock suggests a sedimentary origin, revealing thin, indistinct wavy bedding planes in some samples. The sedimentary rock could be a siltstone, or, in some cases an arkose. 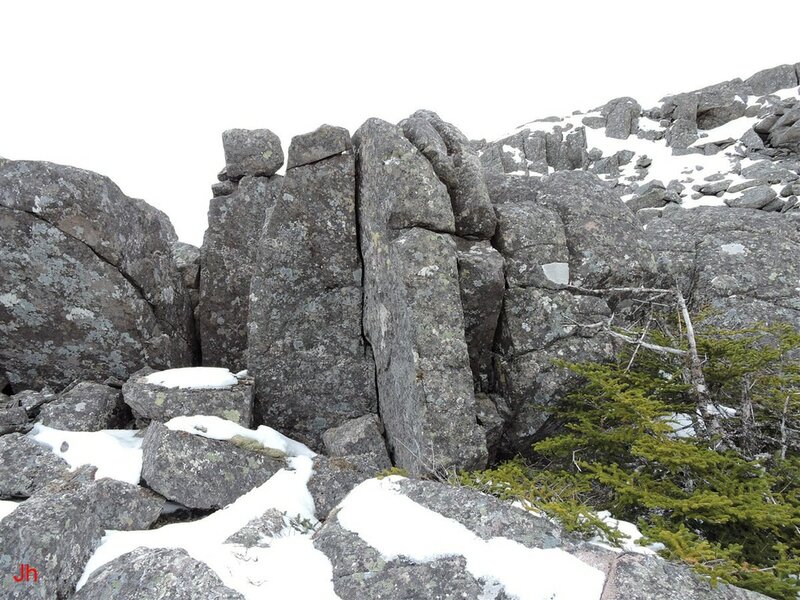 The rock is typically strongly foliated and exhibits pronounced cleavage of tectonic origin as seen in the photo below. Along with the sedimentary rock illustrated above, the ridge, IF-07 incorporates some regions of volcanic rock. A zone of ignimbrite, found near the base of the ridge, is shown below. The field of view in the above photo is about 30 cm wide. The ignimbrite shown is characteristic of the local area and occurs abundantly. The ignimbrite frequently includes large clasts of sedimentary rock, suggesting that the ignimbrite originated in a volcanic explosion postdating the deposition of some of the local sedimentary rock. This observation is significant in that it implies that the local sedimentary rock might have been metamorphosed by the heat of follow-on volcanic activity, changing its permeability and porosity characteristics. The changes might show significant local variations, possibly creating zones of enhanced or diminished permeability that would influence rates of pore-water migration. 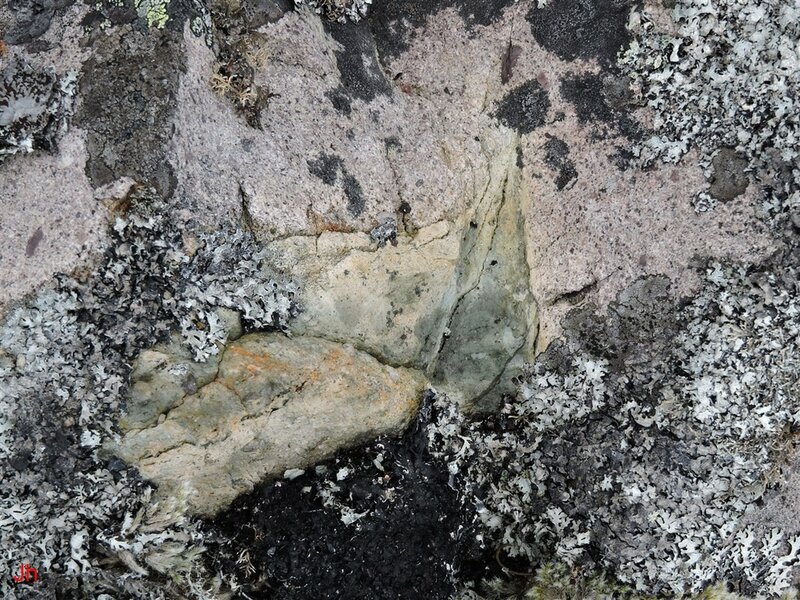 Any metamorphism induced by volcanic activity would have occurred prior to the low grade regional metemorphism that imparted foliation to the rock. The above photo (field of view approx. 20 cm wide) shows a contact between sedimentary rock (lower middle of frame) and ignimbrite (above in frame). This contact was found in rock near the top of the ridge, If-07. As discussed above, the significance of local thermal metamorphism of sedimentary rock lies in the possibility that resulting variations in permeability and porosity could channel or concentrate pore-water migration and thereby affect patterns of bedrock disruption and frost heave. The area around IF-07 includes numerous igneous-sedimentary contacts. 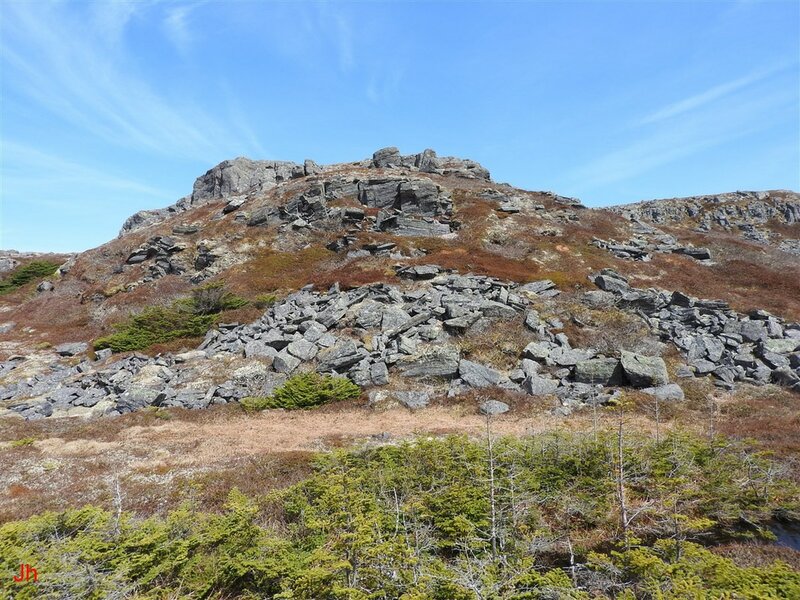 ​The bedrock disruption observed on the ridge, IF-07, is subglacial in origin and the bedrock shifts can, in the general sense, be attributed to glacial plucking. By looking at the ice-induced shifts of individual bedrock fragments, constraints can be placed on how the plucking process proceeded. Most bedrock displacements resulted from the opening of fissures. 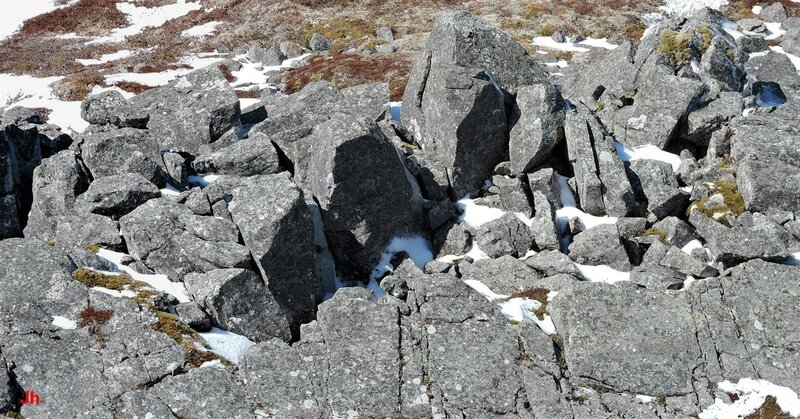 When fissures open uniformly, with little rotation of the adjacent shifted rock, a frost wedging process is indicated. A frost wedging process entails accumulation of ice in a fissure under sufficient pressure to displace adjacent bedrock. Ice segregation, not regelation is suspected to be the only frost wedging process operating at the IF-07 location. 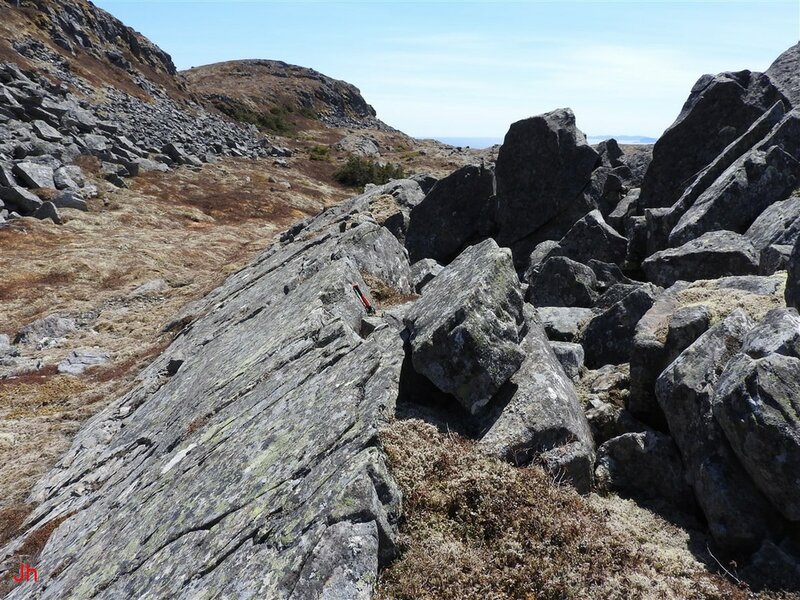 All displaced rock fragments at the site were moved either by the direct mechanical action of glacial ice or by ice segregation. 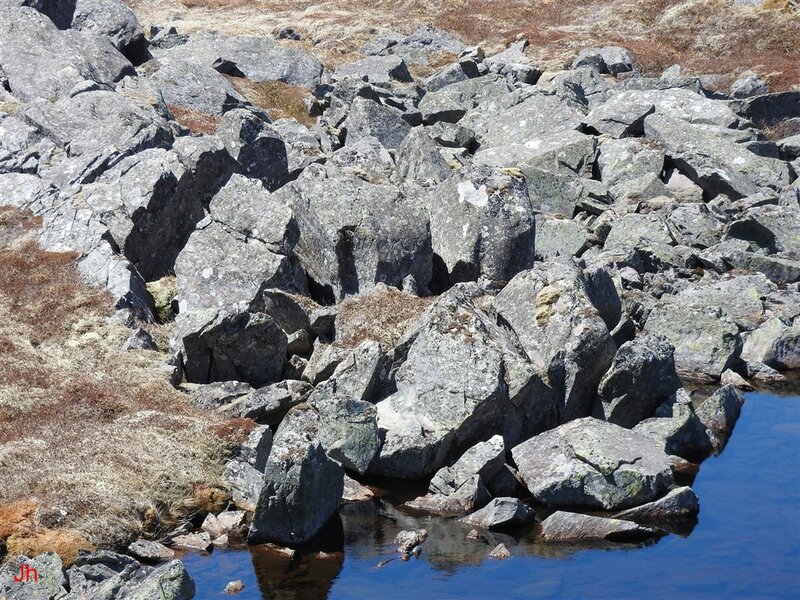 The geometry of some observed rock shifts make them unlikely candidates for direct mechanical loading by glacial ice. 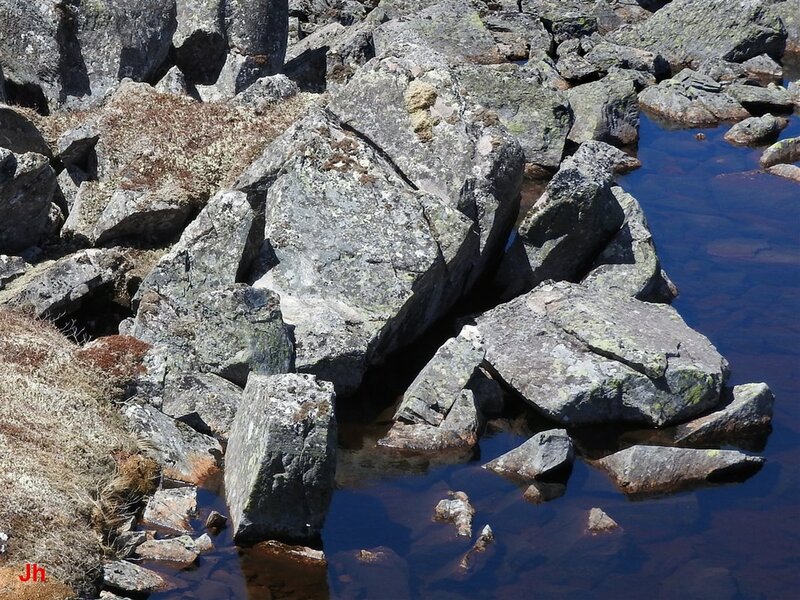 Where loading via glacial ice creep was not the exclusive cause of bedrock shifting, the emergence of pore water from bedrock and the resultant buildup of segregated ice in fissures becomes the preferred explanation for rock displacement. Observations at IF-07 imply that ice, in effect, is capable of moving through intact frozen bedrock. In itself, this observation is not surprising. Given enough time and an appropriate gradient, water molecules would be expected to traverse any heterogeneous substance, such as bedrock. 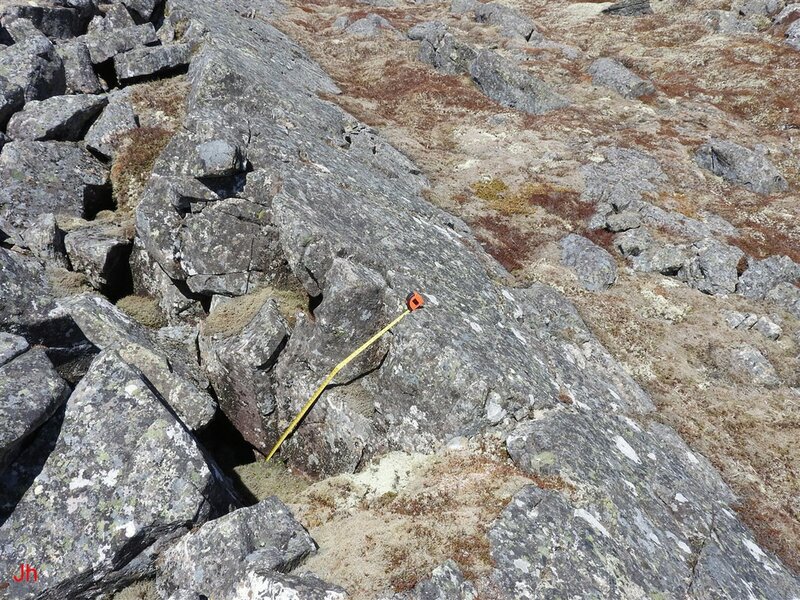 The displacements of bedrock fragments at the IF-07 site are measured in centimeters, and the time available to shift the fragments is measured in centuries. The most interesting observation relates to the similarity of velocities of bedrock shift induced via ice segregation versus via glacial ice loading. 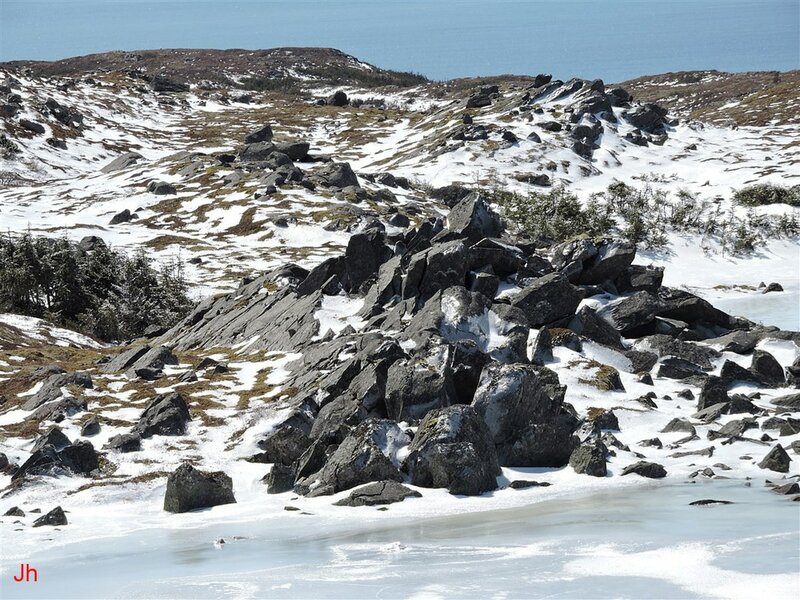 In essence, creep of glacial ice over and around bedrock fragments shifted the fragments at a rate comparable to the rate of shift caused by buildup of segregated ice in fissures between fragments. 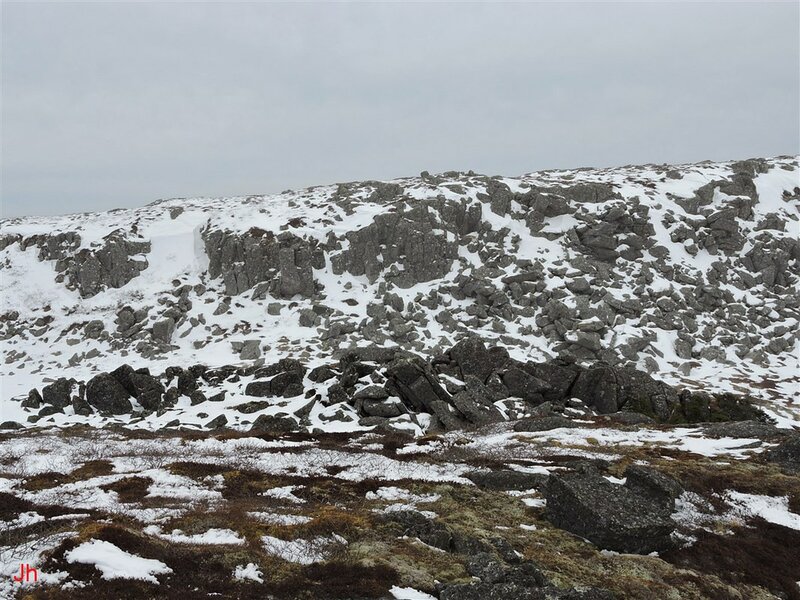 The observations of glacial plucking at the IF-07 site represent a special set of circumstances given that the plucking appears to have been caused by a cold-based ice stream advancing solely by creep. Nevertheless, the processes inferred from observing rock shifts at IF-07 might be applicable in a more general sense to plucking under a wider range of conditions.